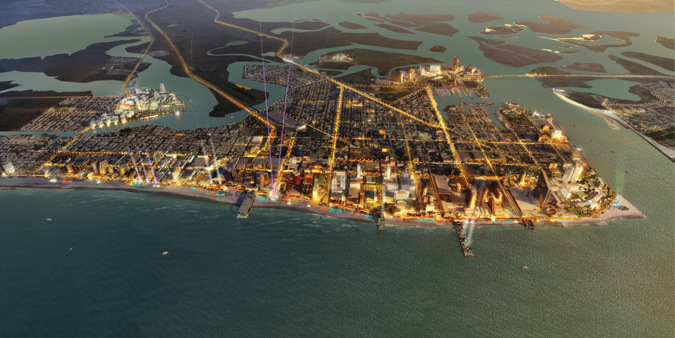 The new CRDA district seeks to integrate boardwalk development within the city's urban fabric. Shortly after taking office, New Jersey governor Chris Christie moved decisively to set the agenda for the ever-ailing resort town of Atlantic City. 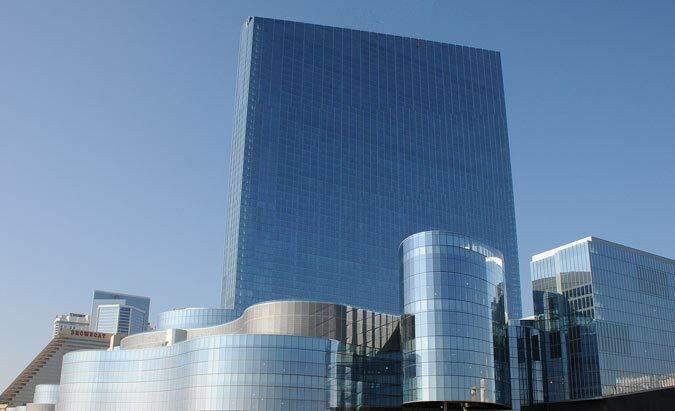 In January 2011, the state created the Casino Reinvestment Development Authority (CRDA), and by May the authority seized control of a large swath—some 40 percent—of the city. Now, one year later, CRDA has released a new master plan by the Los Angeles– based Jerde Partnership. In 1978 the city entered a Faustian bargain when it sold its Miss America soul to the gambling gods, and now the Jerde plan represents a last chance at redemption. Atlantic City’s woes are well documented: grinding poverty, crime, and an inwardly focused casino industry that doesn’t interact with the city. With competition brewing in Pennsylvania and New York, the gaming table crowds have grown thin. Jerde’s answer is to try and bring back the middle class who long ago abandoned the second Sin City. Following the lead of now family-friendly Vegas, the plan calls for a more holistic approach that focuses on spectacle, entertainment, and corporate sponsorship. John Simones, a partner and design director at Jerde, said that the transformation will create a resort town that is distinct from the casinos. Even the casinos are recasting themselves as entertainment complexes, with the $2.5 billion state-subsidized Revel resort leading the way. The Arquitectonica-designed complex had its soft opening on Monday. The website touts restaurants, spas, and meeting rooms, with barely a mention of the casino. A detail of the CRDA district as it stretches into the city (left). 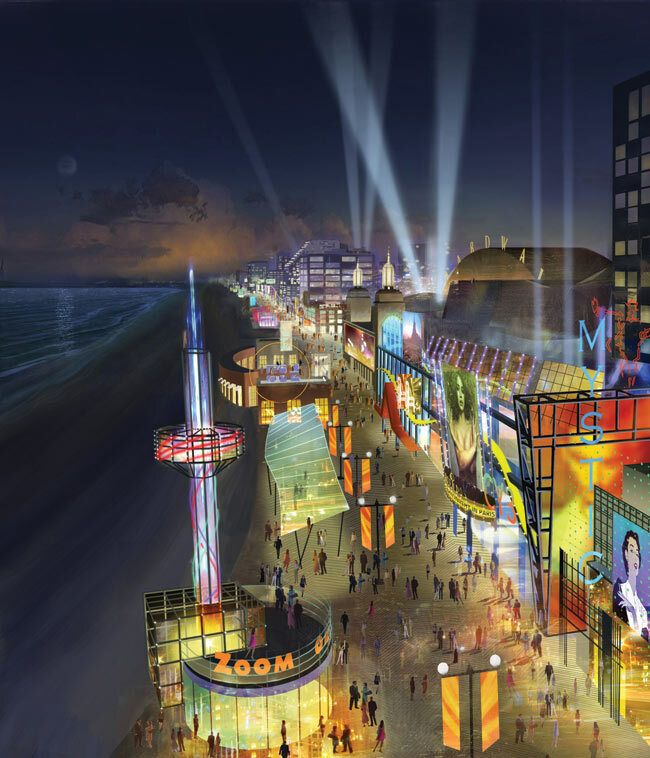 Boardwalk plans include new lighting design and corporate pavilions (right). 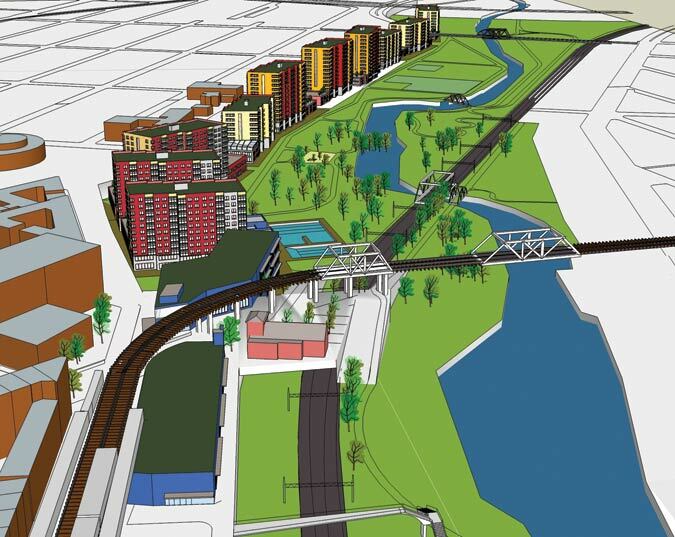 The Jerde plan focuses on the streetscape through connecting greenways, new multi-use neighborhoods, and the boardwalk. “It’s ocean, emotion, and constant promotion,” Simones said, paraphrasing old AC promo materials. “We worked for months on a street experience that has nothing to do with gambling.” He added that the city already has significant tourist anchors in its aquarium, convention center, marina, and, of course, the Atlantic Ocean. With four million people walking the boardwalk each year, the plan creates a core there before shifting focus to the streets. 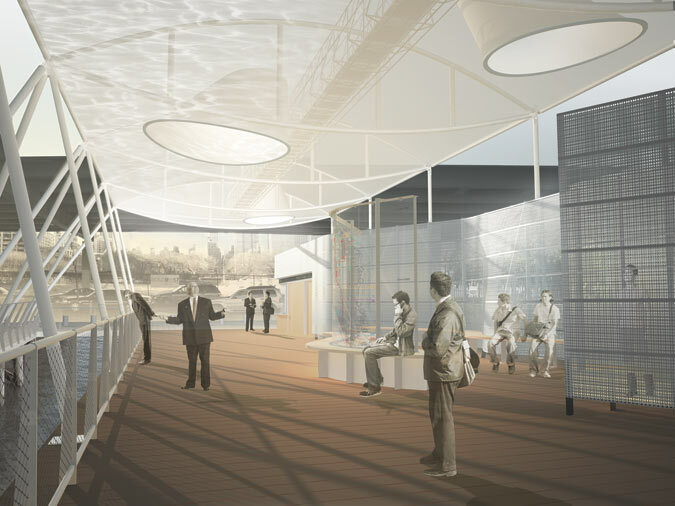 Three “Icons of Experience” will anchor the strip with a band shell, a light show, and a beachside wind sculpture. Between each attraction, Simones envisions up to 15 corporate pavilions that will act as 3-dimensional billboards and experiential stores. 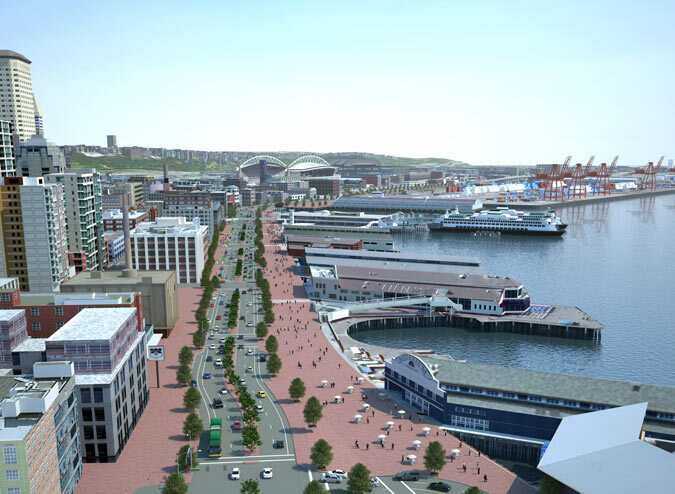 Back out on the street, the plan calls for Atlantic Avenue to become the new “Main Street,” with tree-lined boulevards connecting to the marina and at least two new neighborhoods. Bader Field, a defunct airport, will be transformed into a mixed-use residential neighborhood. Gardner’s Basin, an area adjacent to the marina, still has an active clamming industry. There, Simones foresees education opportunities alongside a youthful cafe culture. Last year Mayor Lorenzo Langford bitterly opposed the CRDA takeover, telling AN he believed it would bifurcate the city. This year he seemed resigned: “There is nothing in that master plan that I found earth-shattering and nothing I found objectionable,” he said. Detail of the lower mezzanine's arc. 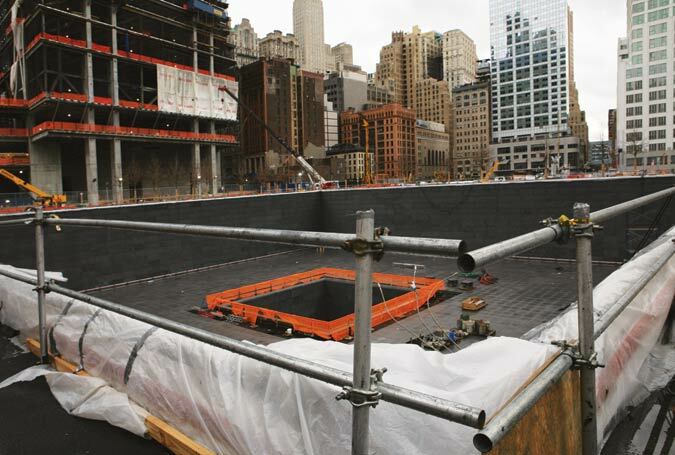 In the waning days of 2011, Shawn Kildare gave a tour 130 feet below Eleventh Avenue. Kildare, a senior vice president at the MTA, delivered some good news to the small group gawking at the huge caverns carved for the Number 7 Subway Extension. The project, he said, is ten months ahead of schedule and under budget. With the Second Avenue subway progressing in fits and starts, hobbled by community complaints, the new Number 7, which boasts few residential neighbors, looks poised to take the prize as New York’s newest subway exension. 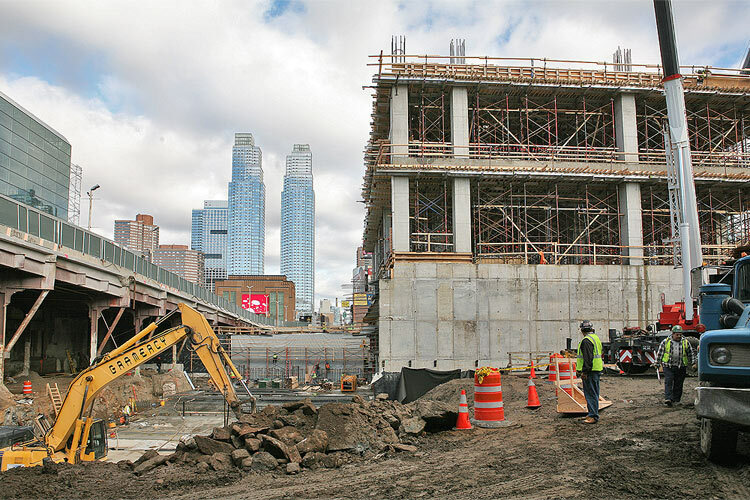 The new station, engineered by Parsons Brinkerhoff, will take one of the system’s busiest train lines from its westernmost terminus at Times Square, to Eleventh Avenue and 34th Street—and perhaps, one day, to New Jersey. The extension may prove a viable alternative to the regional tunnel that New Jersey governor Chris Christie squashed in 2010. As currently planned, the new station will serve the mass-transit-challenged Javits Center and Related Hudson Yards project, and Brookfield Properties’ Manhattan West proposal. 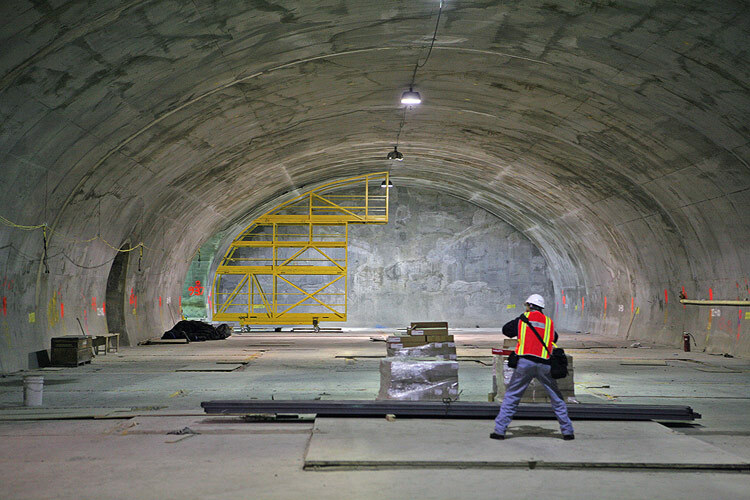 It will accommodate 25,000 commuters per hour, and an additional six trains added to the line will find room to park and/or maneuver on extra tracks positioned just north and south of the new subway platform. 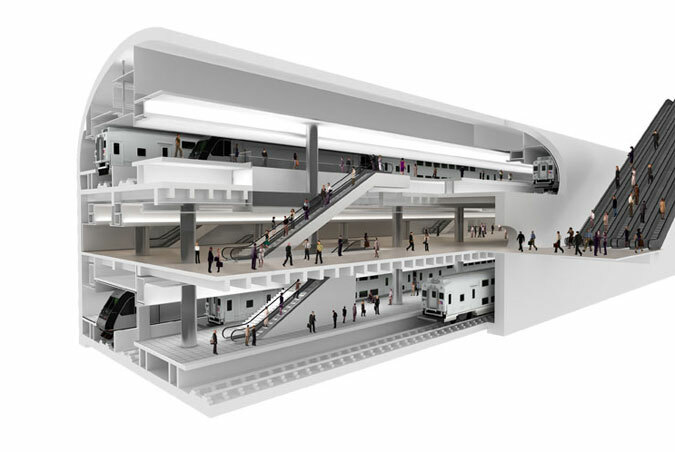 From top, left to right: Rendering of The lower mezzanine above tracks; Workers prepare a new communication center beneath Eleventh Ave. as ventilation rises at right; Subgrade work continues for parkland entrance to subway; Two tunnels run east to meet the park entrance; Cross section from left to right (west to east) shows tracks and lower mezz, escalators, upper mezz, and park entrance. 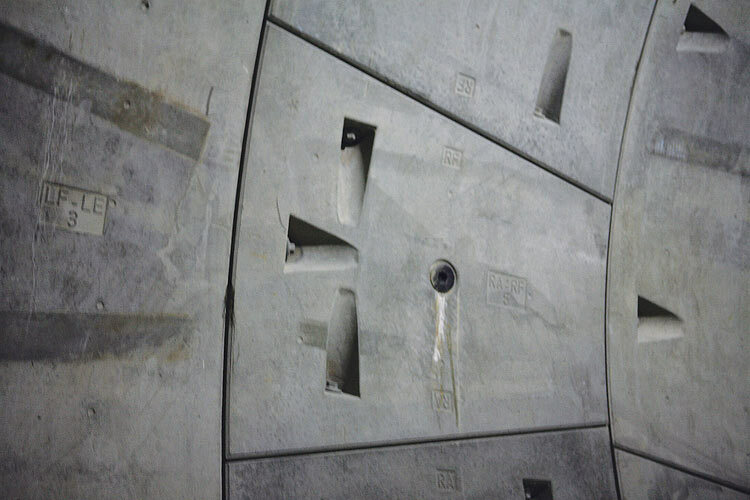 Kildare noted that this was the first time that a tunnel-boring machine set the precast concrete arch segments into a “mixed-face condition,” where rock and soil meet. 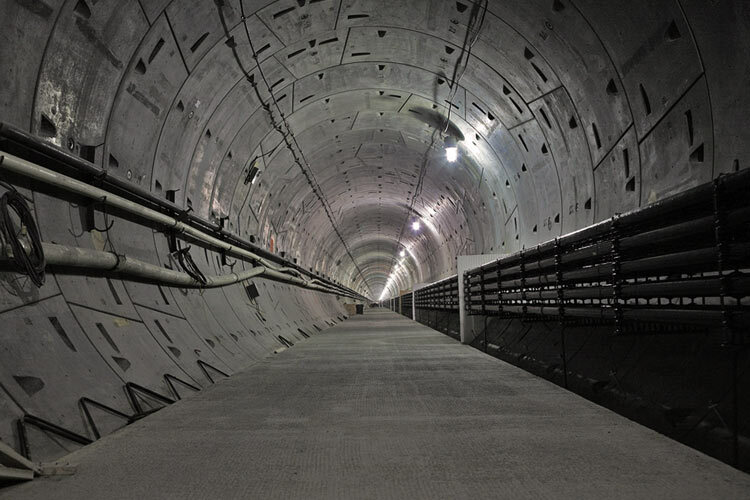 “A tunnel-boring machine is just like any other drill,” said Kildare. 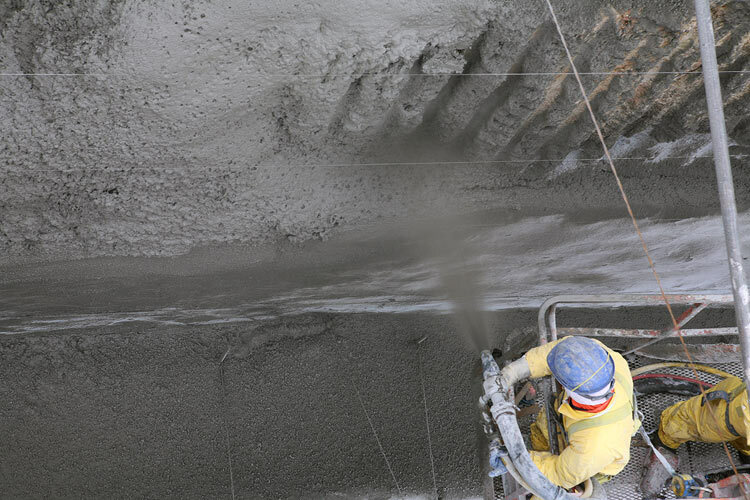 “If you take a drill and you have wood on one side and steel on the other, the drill is going to try to run toward the wood, the path of least resistance.” Similarly, a boring machine will try to grind away from rock and toward soil, which will create water infiltration. 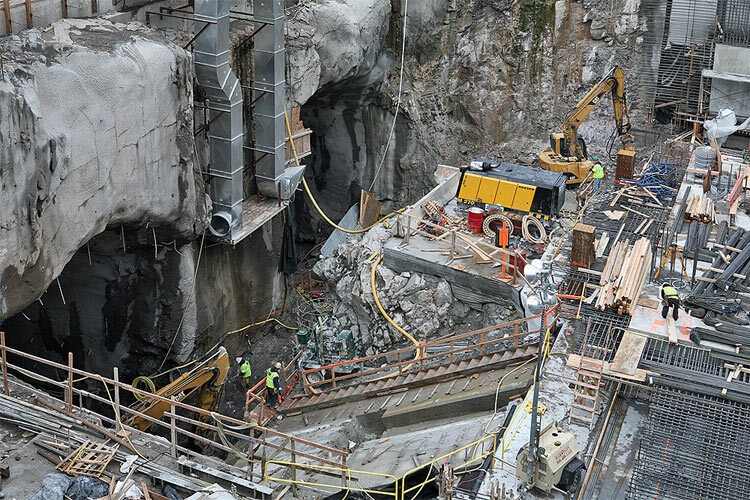 In this project, the boring machine drilled through rock and frozen soil. 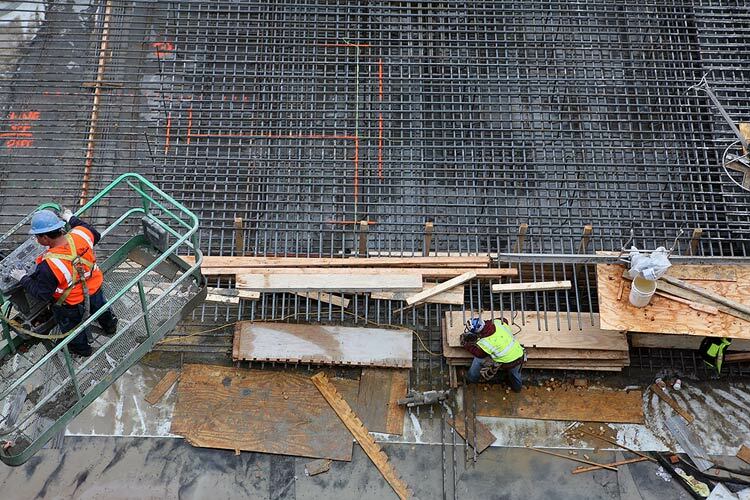 Just behind the drill, the machine placed the five precast segments into position and workers immediately pumped concrete grout between the panels and the rock or soil. Along Eleventh Avenue the tunnel dodged Amtrak and Lincoln Tunnel tubes before curving east to meet the existing Number 7 tracks. This meant digging beside the Port Authority Bus Terminal while passengers disembarked 20 feet away. A few blocks west, the sandhogs borrowed beneath the Times Square/Eighth Avenue pedestrian passageway while commuters crisscrossed overhead. 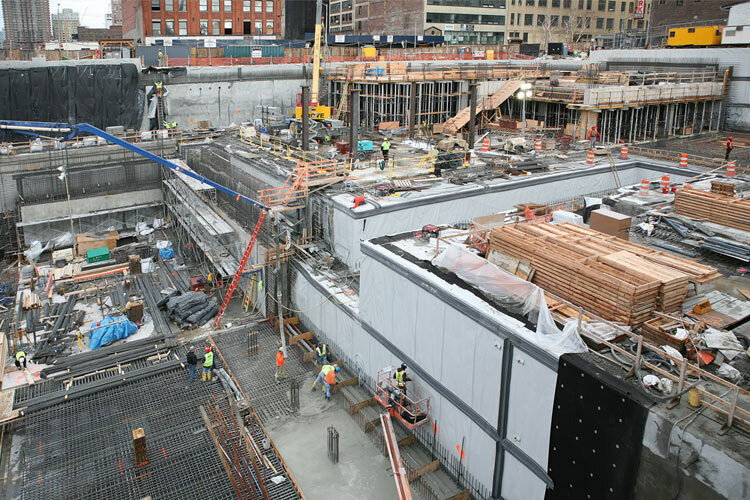 Clockwise from top left: A back of the house ventilation chamber that will not be seen by the public; The Number Seven line extension tunnel; An elbow arch is a place holder as future access point not currently in plan; Workers prepare rebar; The varying placements of the keystone panels were determined by computer; Cement being sprayed atop Manhattan schist. 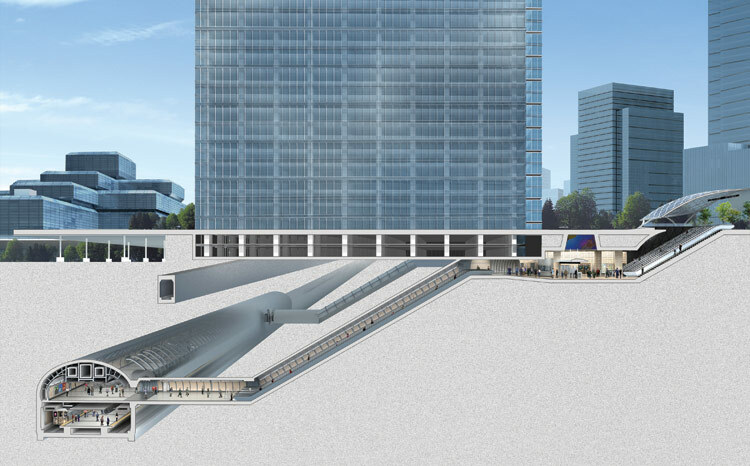 Dattner Architects, designers of the new station, found the Canary Wharf station on the Jubilee Line in London to be a suitable prototype, if not an inspiration. 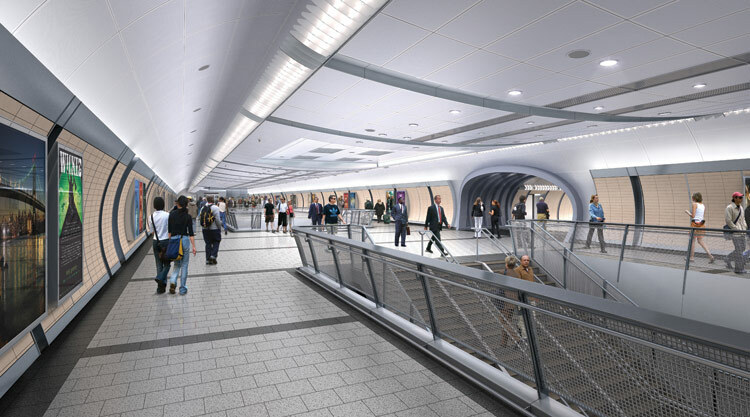 “It had many of the same characteristics as this project, which is an extremely deep station requiring some very long escalator runs,” Richard Dattner said of the Norman Foster–designed station in London. 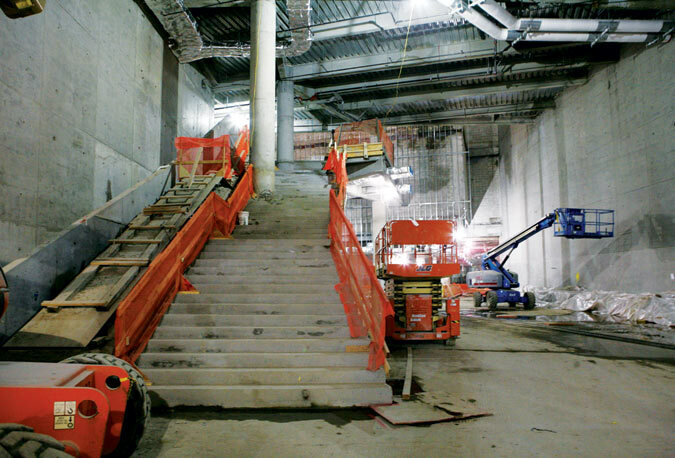 The new station will also include incline elevators, another first for New York City. Another similarity to Canary Wharf is that both stations open to an aboveground park, in this case one designed by Michael Van Valkenburgh. 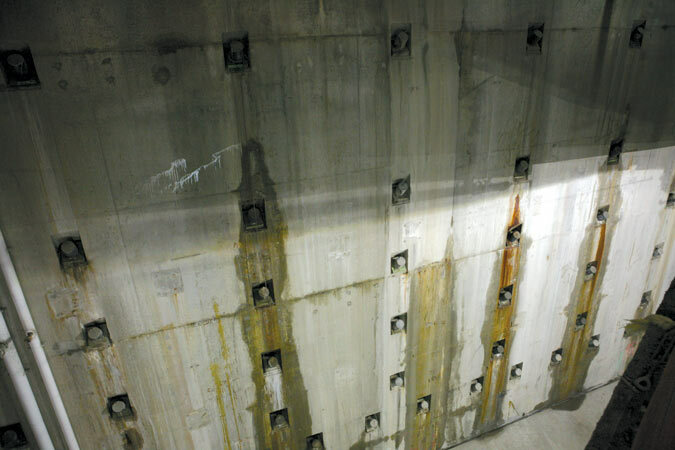 Down at train level, a generous 35-foot-wide column free platform will greet passengers. 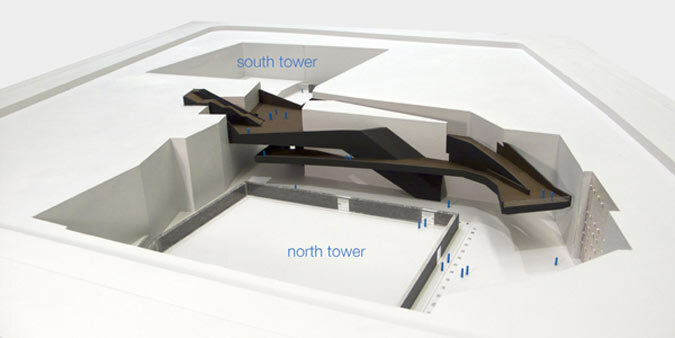 Rendering of the column free platform. 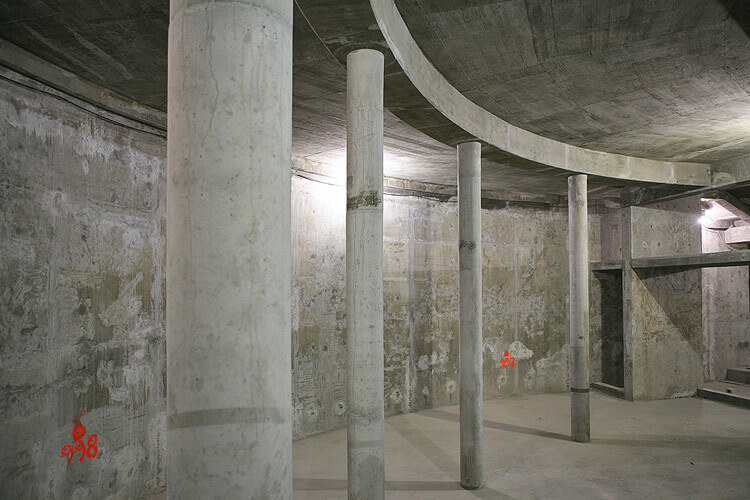 Currently, the smoothly finished raw concrete and large arc of the mezzanine level recalls London’s Tube or Washington, D.C.’s Metro. But the finished design blunts the curve with a drop ceiling to accommodate current safety codes requiring substantial ventilation and exhaust ducts. “When you see a diagram of the cavern and the final station, something like 30 percent of the actual cross section will be used for exhaust and supply ventilation,” said Dattner. 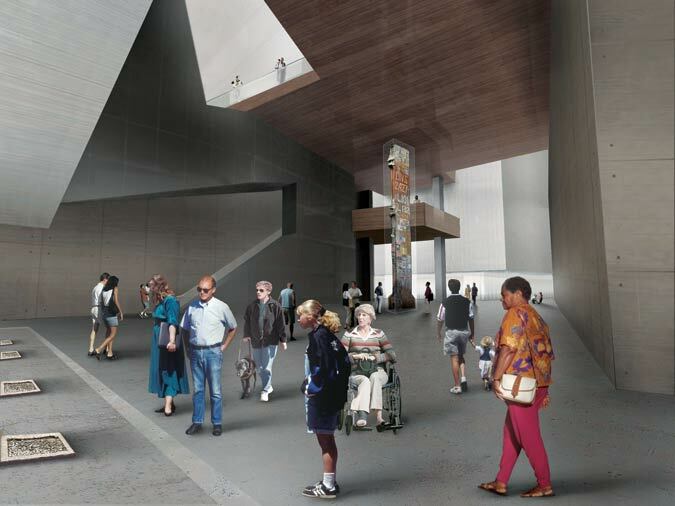 While the entrance level will feature installations recessed into the ceilings by artist Xenobia Bailey, much of the design remains clean, bright, and utilitarian with clearly defined circulation. But for now, in its unaltered concrete state, the station appears as an unadorned and impressive subterranean feat, like an elegant cistern without water. 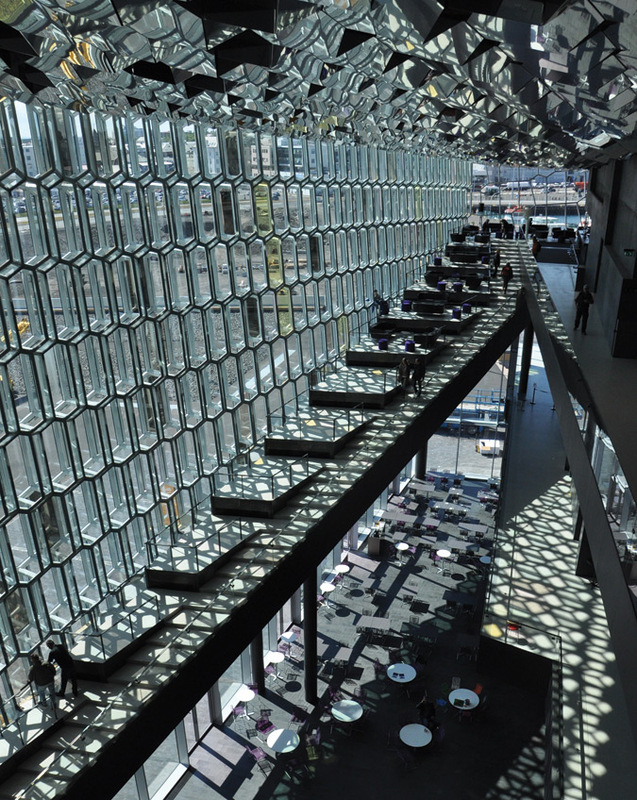 In Reykjavik, Olafur Eliasson's Harpa Concert Hall facade incorporates ten types of glass. As architects push for never-before-seen designs at ever-lower prices, they are learning that some risks don’t pay off. When they do, however, the results achieve a brilliant crystallization of glazing art and science. 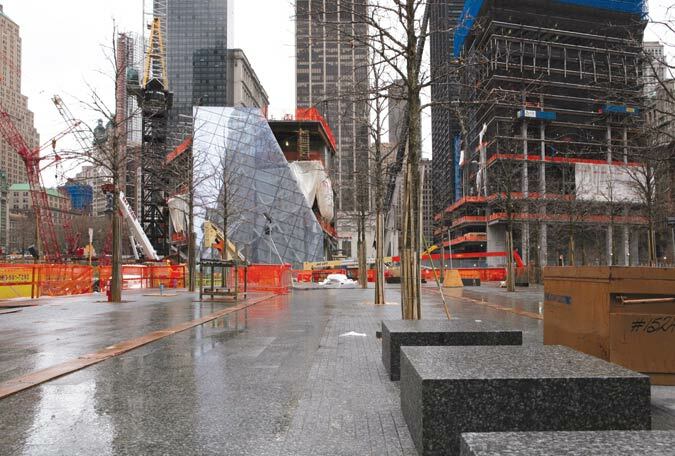 Last spring, the Port Authority of New York and New Jersey shattered a dream when it dropped SOM's plan to clad the base of One World Trade Center in prismatic glass. The design element was meant to emanate “splays of color” from the building’s podium, but after several years and nearly $10 million spent on design development, the team found itself without a viable sample. It had paid to build specialized equipment to cut 1-inch-thick, 48-by-159-inch glass panels with a grooved, pointed pattern, then temper the prismatic sheets and laminate them to strong barrier glass. More than 800 twelve-sided "quasi bricks" forming the building's south facade are reflected in the interior's faceted and mirrored ceiling. The project was going to be an exemplar of architecture’s best hopes for the future of glass: huge panels with a highly customized, carefully fabricated visual quality that could meet strict safety requirements. 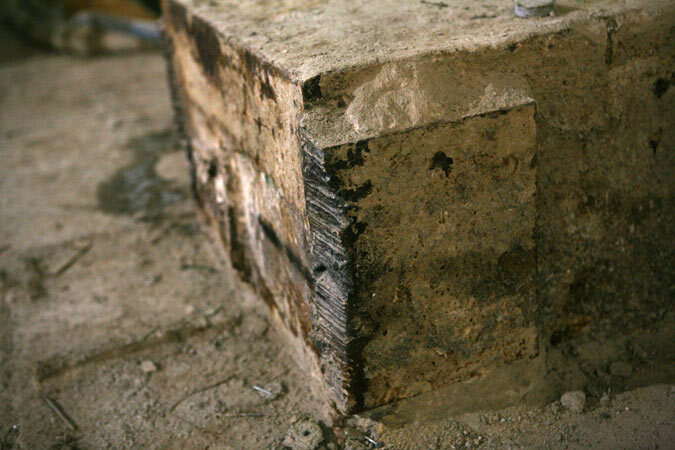 But during impact testing, the panels broke into large shards rather than holding together as laminated glass should. The team finally announced the design was too technically difficult to realize. Or was it? 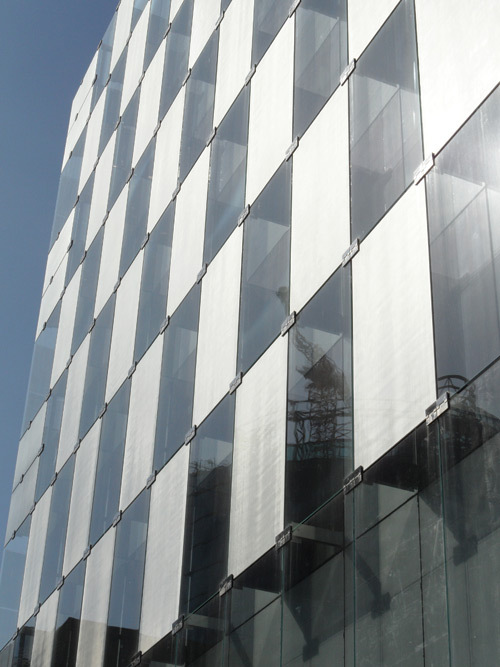 Nathan Munz, managing director of Australia-based glass fabricator Glassform, said that he manufactured a sample of viable prismatic facade glass after being contacted in May 2010 by a project manager with Solera/DCM, the contractor charged with installation of the podium facade. According to Munz, Glassform made the list of approved fabricators for the project, along with Ontario-based Barber Glass Industries, before Solera’s fabrication subcontractor, Las Vegas-based Zetian Systems, gave the fabrication work to Sanxin Glass in Shenzen, China. Barber, too, was contacted in March 2011 about getting back on board with the project; the company had developed a full-scale mockup for the project in 2009, before going into receivership last year. When it seemed as if option A had failed, the team “started getting worried because they had a project to deliver and the Chinese friends were not supplying even small samples,” said Munz. “They started calling people to see if there was an option B.” Glassform developed a sample without accepting fees and sent it to New York the following month. “I had meetings with Solera and their engineers and they were impressed,” Munz said. But he left confused after Tishman, the project’s construction manager, declined to meet or to sign a confidentiality agreement about his fabrication techniques. The concert hall's exterior (left) and a detail of the glass facade (right). Munz returned to New York in October 2010 with a larger 4-by-2-foot sample, this one protected by an application for a U.S. patent and manufactured with equipment “modified in a very unconventional way.” He brought the sample to a meeting with project manager Ken Lewis and several other SOM team members. “The sun was streaming through the window and it hit the glass and these people freaked, absolutely freaked,” remembered Munz. 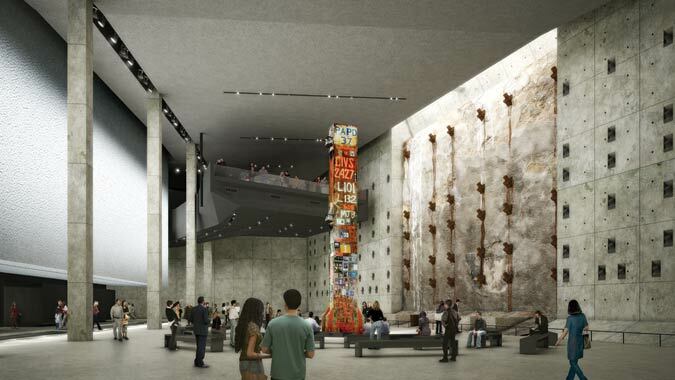 “They said it was amazing.” But after Tishman again declined to meet with him, Munz was left to conclude that the construction manager had already decided to abandon the project unless it could be realized with Zetian. 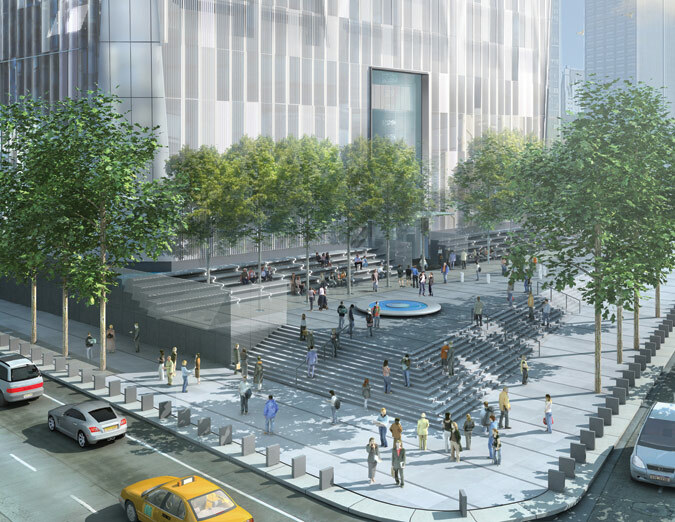 When contacted by AN a spokesperson for Tishman declined to comment about the project’s glass. In spite of the trial and error involved in testing new designs, architects are determined to push the limits of glass technology. In most cases, innovation is more easily achieved in Europe where building teams are likely to negotiate a way to use the best product rather than incorporate more of a lower-priced option. The proximity of several glass-producing nations also fosters an adapt-or-die mentality: Italy depends on exporting its products to France and Germany, forcing them to advance their industry quickly in order to compete with domestic fabricators in those countries. 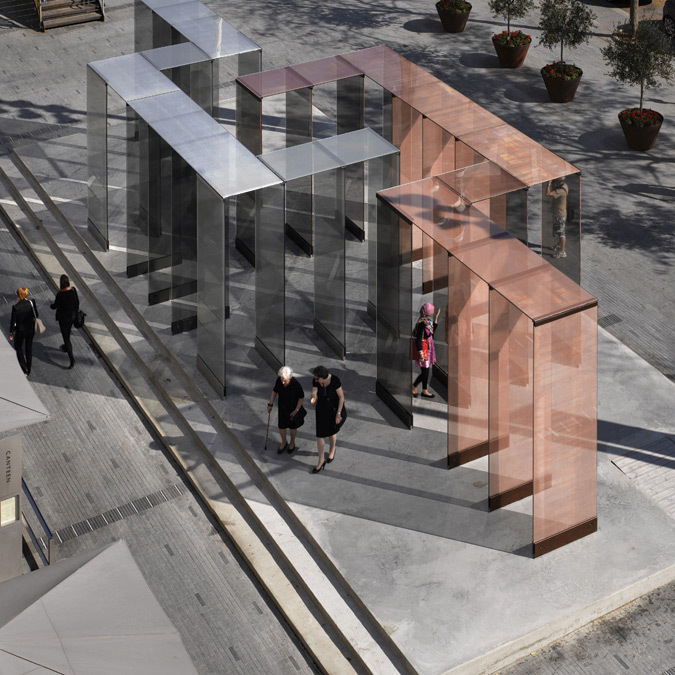 David Chipperfield's Two Lines pavilion in London with copper and aluminum glass interlayers. 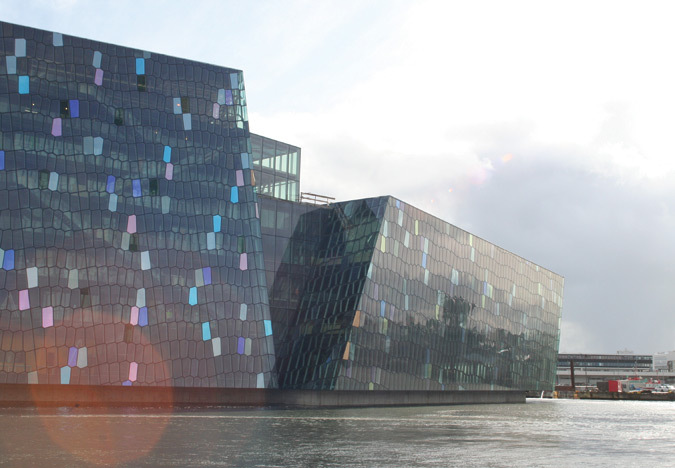 Reykjavik’s new Harpa Concert Hall and Conference Center is a prismatic addition to the city’s waterfront and a glamorous example of collaboration rather than compromise. 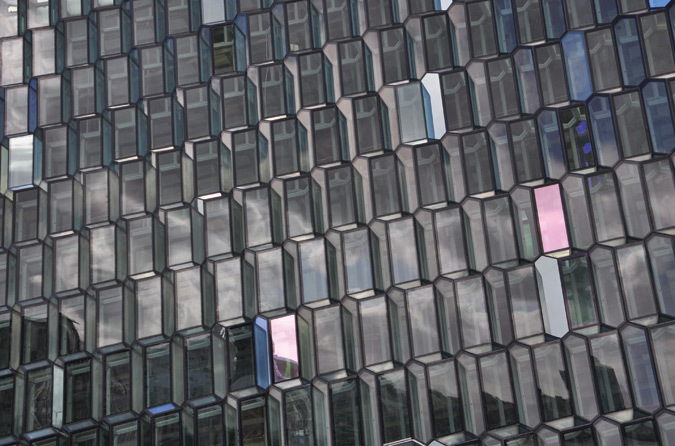 Designed by artist Olafur Eliasson with Henning Larsen Architects, the 301,000-square-foot building’s south face is composed of 823 “quasi bricks” mimicking crystallized basalt columns commonly found in Iceland. Each brick is a stackable, twelve-sided module of steel and glass that Eliasson and his structural engineers designed using several digital and physical modeling techniques. The north, east, and west facades are flat variations of the south face, as if the bricks have been sliced at an angle. Ten types of glass were used for the skin: yellow, green, and orange dichroic panes reflect their complementary colors, blue, red, and purple; clear, antireflective, and five kinds of reflective glass are also layered carefully to alternately emphasize depth, solidity, or transparency at different vantage points and light levels. At night, the facade glows with more than 700 LED strips with optics developed with lighting manufacturer Zumtobel. “It has been a process pretty much like doing a painting,” said Eliasson in a project presentation video. “When you have the colored glass that has a tendency to stand out, I have put a low-reflection glass next to it in order to give you a sense of it being a volume.” The hall’s foyer, balconies, and ceiling are oriented to catch light and color. 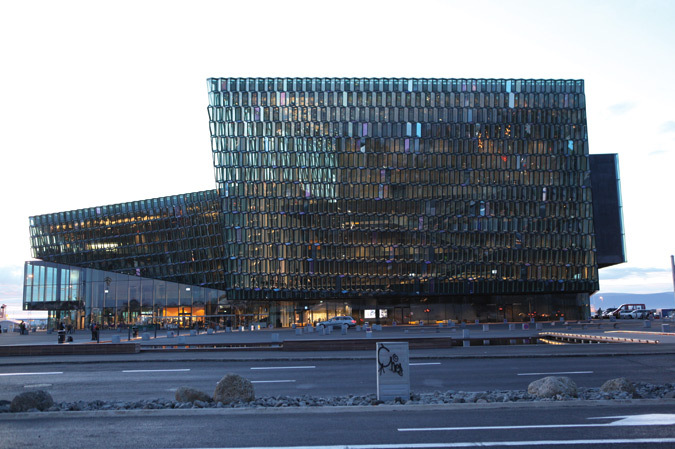 The facade functions, too, standing up to Reykjavik’s punishing winter winds and preventing noise from a nearby highway from disturbing concerts inside. 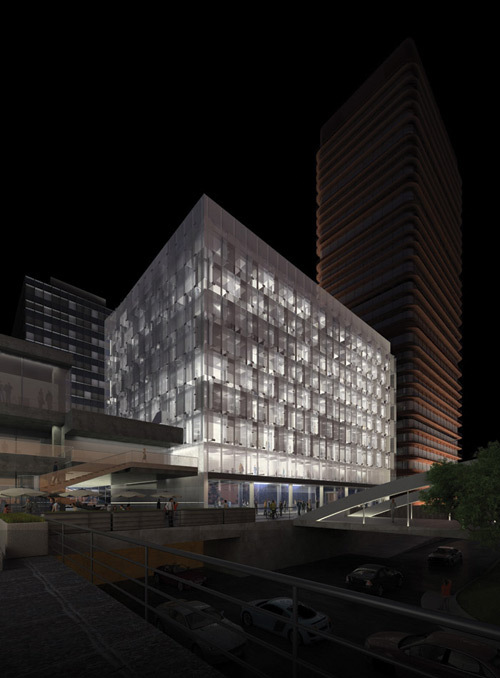 The facade of the Castellana 79 business center in Madris, designed by Rafael de La-Hoz, incorporates aluminum SEFAR Architectural Vision interlayers. As advancing digital modeling and engineering capabilities allow integration of cutting-edge shapes and sizes, technical material advances are also driving new designs. David Chipperfield’s Two Lines pavilion was one of this year’s London Design Festival Size + Matter commissions pairing designers with materials and manufacturing processes. Chipperfield created the installation with 28 panes of unframed laminated glass panels embedded with SEFAR Architecture Vision and a DuPont SentryGlas interlayer, a new fabric with a translucent single-sided metal coating. Built in collaboration with Arup, the project’s orthogonal glass walls in copper and aluminum interlayers are topped with horizontal glass panels as long as 16 feet with corresponding colored metal connections, giving a glimpse of the shimmering, diffusive quality a facade could achieve with the same materials. According to DuPont, SentryGlas has better adhesion with the fabric mesh than Polyvinyl butyral interlayers, increasing moisture resistance and temperature stability in the long run. 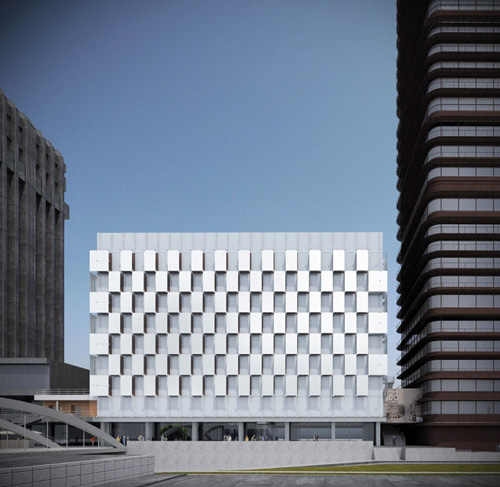 The Castellana 79 business and commercial center in Madrid, designed by Rafael de La-Hoz, is one of the first facade projects to be completed with the material. 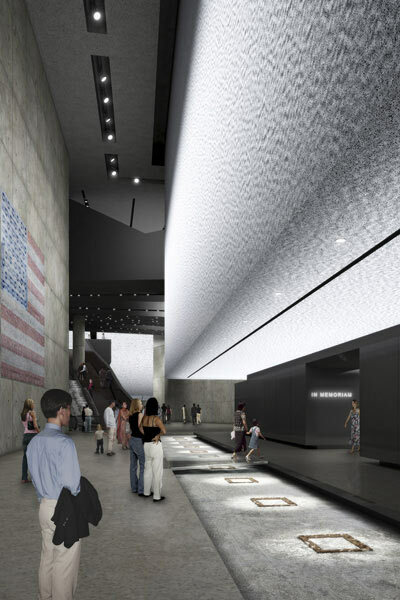 A rendering of SOM's original prismatic glass podium for One World Trade. As many fabricators try to get into the decorative market, similar fabrication equipment can produce radically different results depending on who is behind the wheel. “In the architectural community, the biggest problem is that designers are very influenced by sales people, but they don’t do their due diligence in asking questions about the performance,” said Lax. Pulp recently lost a project comprising nearly 40,000 square feet of gradient sandblasted facade glass to a lower bidder who was ultimately not able to realize the architect’s original design intent. Companies operating new digital glass printing equipment without hiring art departments to tightly control image and color quality could be another concern for architects as technology advances. “It’s kind of like buying a limousine but being too cheap to hire the driver,” said Lax. As a series of balcony glass failures in Toronto recently demonstrated, poor specification practices for even simple components can end up costing glass-heavy projects a lot of money. This summer, Ontario-based Lanterra Developments suffered a PR nightmare when glass sheets fell from the balconies of three of its recently completed Toronto condominiums. The fifth, and final, sheet to break fell from the 29th floor and hit a pedestrian below. Lanterra replaced the tempered balcony glass in all three projects with laminated glass sheets, which should remain in place even if fractured. 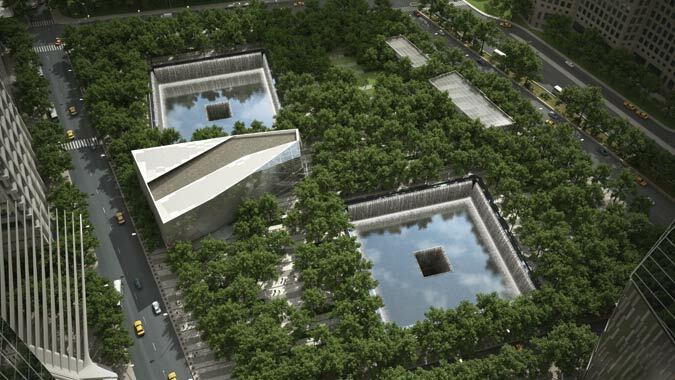 The failures raised questions about the source of the project’s glass, and whether heat-soaked glass, which has undergone a process that would reveal any inherent flaws, was specified and delivered. A few weeks later, Seattle’s NBBJ-designed Four Seasons Hotel and Private Residences experienced its third balcony failure and opted to replace its tempered glass balustrades with laminated lites as well. 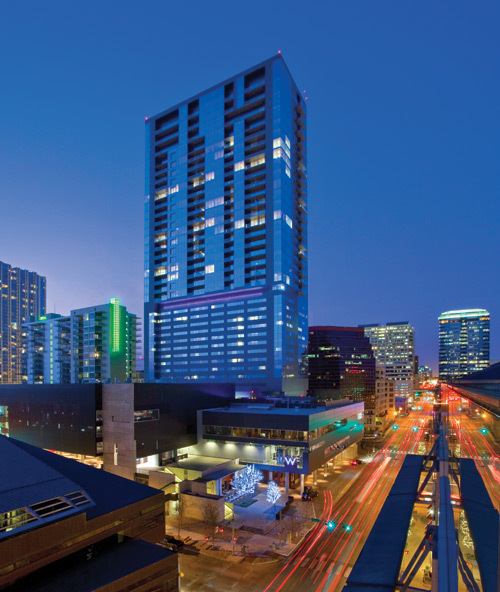 The W Austin Hotel, designed by Andersson-Wise Architects, also closed for several days in June when two falling glass sheets injured four people on the pool deck; three more lites fell in subsequent weeks. Again, the property owner replaced the tempered balcony glass with laminated panels. A report conducted by Curtainwall Design Consulting (CDC) concluded that debris from the building’s slab edges had damaged the edges of the tempered glass balconies, which were unprotected by a top railing, causing them to shatter. Project developers and design teams have not released the sources of the failed glass, but glass fabrication experts speculated that all of the buildings used tempered balcony glass from Chinese manufacturers as a cost-cutting measure. This glass is more likely to contain nickel sulfide inclusions, impurities that can cause breakage unless heat soaking detects imperfections, which have largely been removed from domestic glass manufacturers’ products. 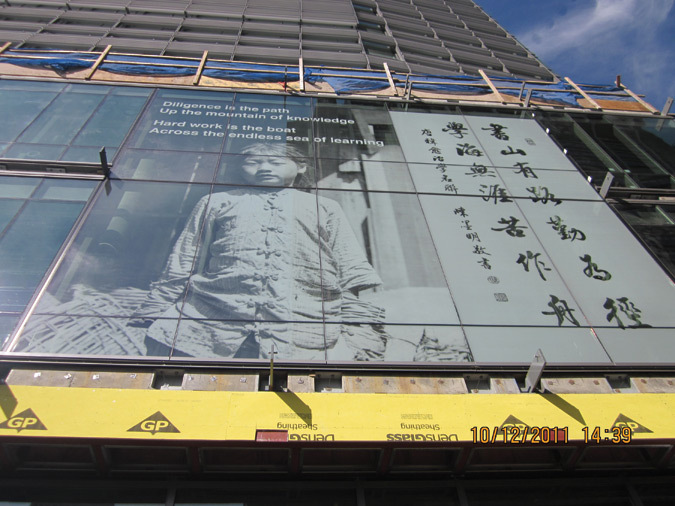 A new facade on the City College of San Francisco's Chinatown campus is printed using Viracon's high-definition silkscreen process (left). The W Austin Hotel closed for several days after multiple glass balconies shattered. All tempered glass was replaced with laminated panels (right). And pieces are likely to get bigger—GGI’s furnace can temper glass up to 110 by 236 inches, but the logistics of cutting, polishing, drilling, and storing a piece of glass that size are still being worked out in the company’s plant. “Architects are pushing us a lot,” said Don McCann director of international sales for glass fabricator Viracon. 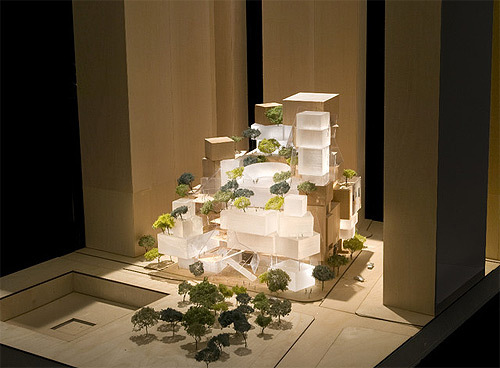 “They want larger glass and to span larger openings. It’s requiring us as a company to get larger fabrication equipment.” As a lower-cost alternative to digital printing, the company recently launched Viraspan Design-HD, a high-definition silkscreen process that creates half-tone pixels and gradation within an image or pattern. While the designs they can achieve are beautiful, they are not just decorative: Being able to engineer a larger piece of glass into a building could mean a reduction in other materials and in interior finish-out costs, and incorporating the right frit, low-e coating, or interlayer into facade glass can reduce strain on mechanical systems. “It’s a first-cost savings,” said McCann. If architects—and their clients—are on board, they can make sure the glass works for itself. 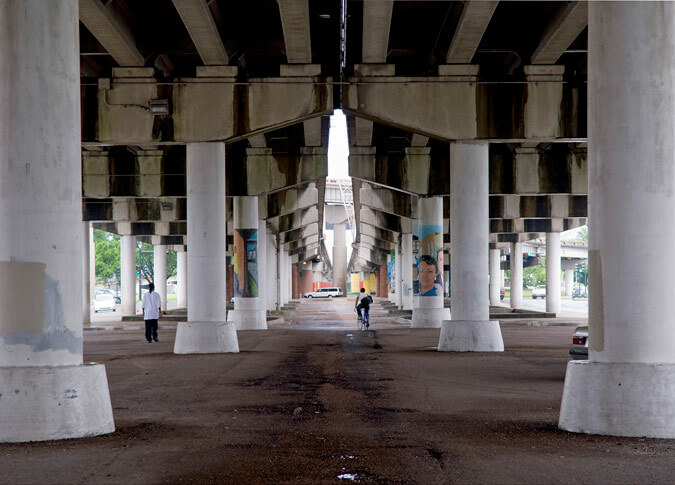 Underneath New Orleans' elevated Claiborne Expressway. Remember highways, those ribbons of concrete that in the 1940s and 50s looped together cities, states, and regions in much the same way as ocean liners connected America to Europe in the 20s and 30s? Once highways represented the country’s proudest infrastructure. Those days are over, as are the urban policies that allowed New York’s ultimate powerbroker Robert Moses, late in his heyday in the 60s, to ram roads (the bigger, the wider, the busier the better) through fragile communities, ripping the urban fabric to shreds for decades to come. Today’s urban thinking puts pedestrians before cars. For Robert Moses, a mastermind in the dawning age of the car, four-wheel travel promised the world and then some. Highways were supposed to be the “lungs of the city”—and those concrete behemoths, once thought to be permanent fixtures in cities, would preserve his legacy. But what would Moses say today if he knew that major cities across the country now see highways as a root of blight and are considering taking down his creations? Half a century after the height of urban renewal, a national movement is set to try a new road to urban growth, reintegrating communities through dismantling the highways that were the focus of Moses’ life’s work. 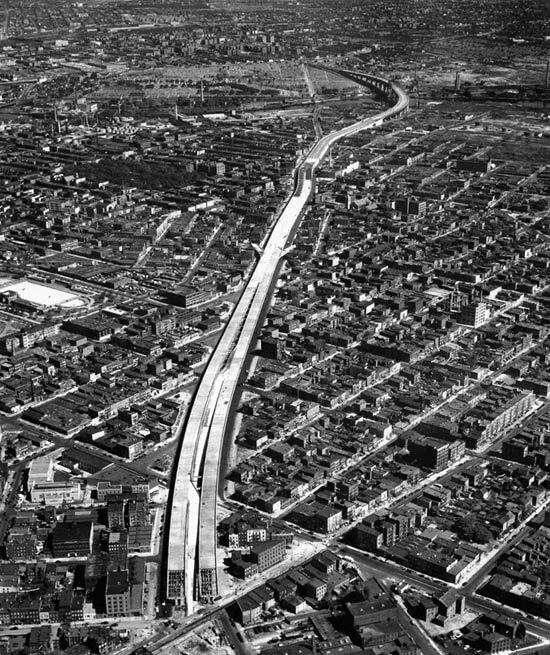 Aerial view of the Brooklyn-Queens Expressway looking north, 1950. Anti-highway sentiment is nothing new. In fact, the country is dotted with unfinished highway projects, from New York’s Sheridan Expressway to an extension of San Francisco’s Embarcadero Freeway, that were halted by public opposition. One of the watershed moments in the movement against highways was the campaign against one of Robert Moses’ most controversial proposals: the Lower Manhattan Expressway in New York, a ten-lane highway that would have razed the present-day neighborhoods of TriBeCa, Soho and Chinatown. Activist Jane Jacobs and local residents lobbied to defeat his proposal, ushering in what some would consider a new school of thought that emphasized neighborhood life and community input in urban planning. 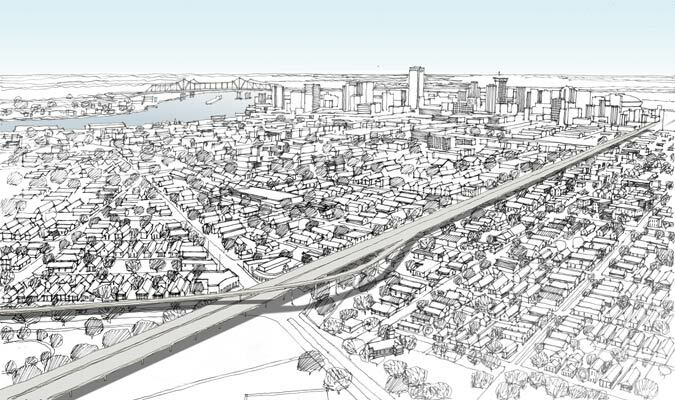 The Claiborne Expressway is a disruptive presence in New Orleans (top); An aerial depiction by architects Waggonner & Ball of the Claiborne Expressway today (left) and a preliminary rendering of what the city could look like with Claiborne Avenue restored as a surface boulevard (right). The recent buzz about highway removal projects is another powerful testament to the reversal of Robert Moses and what post-war America accepted as good urban planning. Local officials are looking to demolish highways to end the blight they brought to the neighborhoods they run through, 60 years after cities first started putting them up in the name of progress and modernity. 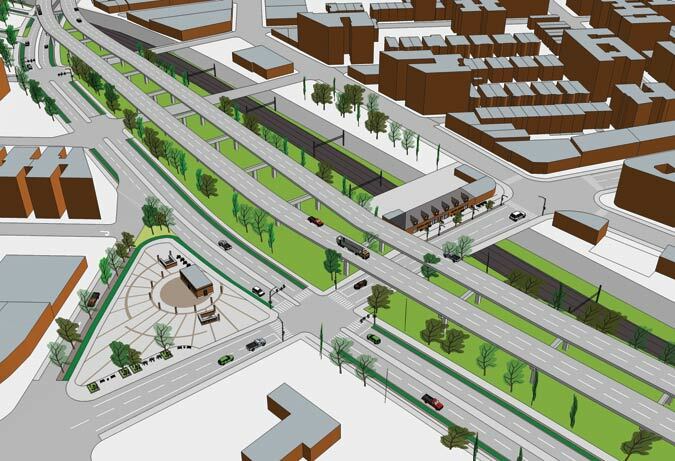 In New Orleans, community groups believe that replacing the stretch of Interstate 10 that runs above Claiborne Avenue—a once-thriving commercial corridor in the Treme neighborhood—with a boulevard would rid the city of an eyesore and promote economic development. 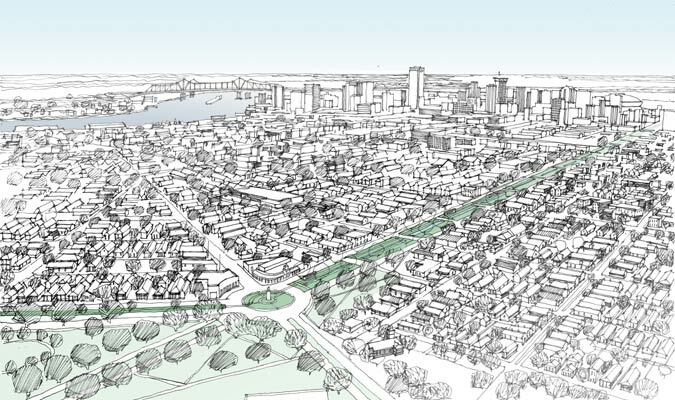 The proposal has become central to rebuilding the city, included in both the Unified New Orleans Plan created for post-Katrina recovery and the city’s new master plan. Decades before the hurricane, the construction of I-10 in the 1950s precipitated Treme’s decline from one of the city’s wealthiest African-American neighborhoods to an area with high poverty and vacancy rates. The number of businesses on Claiborne Avenue fell 75 percent between 1960 and 2000, says the community organization Claiborne Corridor Improvement Coalition who commissioned the study from architects Waggonner & Ball working with Smart Mobility. 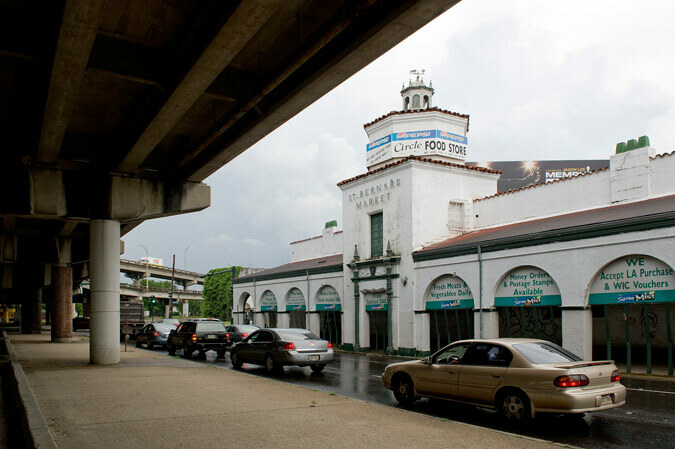 The St. Bernard Market in New Orleans facing the elevated Claiborne Expressway. In New Orleans and elsewhere, removing highways is providing an opportunity to redress the racist urban renewal policies of the 20th century that impacted communities inhabited largely by minorities. In 1974, construction of Route 40 in West Baltimore demolished 700 homes and displaced 2,000 residents in a middle-class African American neighborhood. Demolition of Route 40, otherwise known as the infamous 1.4 mile “Highway to Nowhere,” began last fall. “Tearing down every last remnant of that ill-fated road will help heal the communities that have long been split by the portion of highway that we couldn't stop,” said Senator Barbara Mikulski, who launched her decades-long political career rallying against the highway. Now, demolition will restore a street connection between two neighborhoods and make way for expanded station parking for an existing commuter rail line and a future light rail line for the city. “It’s not just a good land use solution or transportation solution, but it rights many past wrongs done to the communities that the highway runs through,” said Joan Byron, the policy director at the Pratt Center for Community Development in New York. Byron also credits the re-emergence of cities for the growing movement against urban highways. The United Nations reported that more than half the world’s population lived in cities for the first time in history in 2007. “Affluent middle class people are moving back to cities,” Byron explained, “So land blighted by highways is now being valued differently.” In New York, pressure to cap the Brooklyn-Queens Expressway, which forms a below-grade trench through Brooklyn Heights, Cobble Hill, Carroll Gardens, and Williamsburg, is mounting as more people move to the west side of the highway. 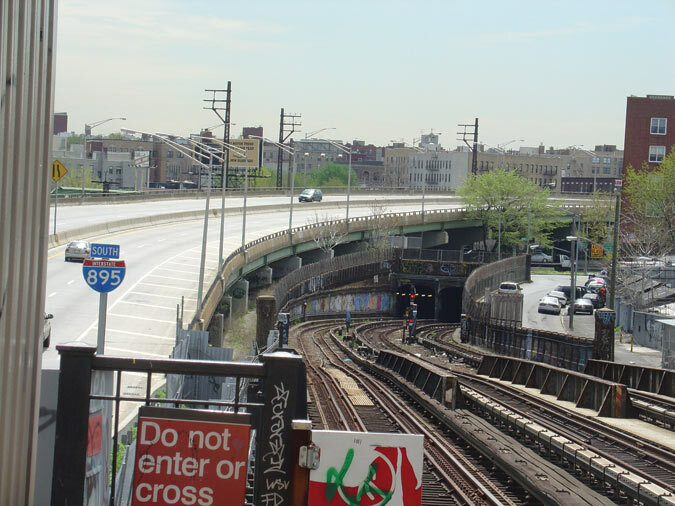 Residents near the highway, which was built in the 1950s and 60s to connect the city’s boroughs, have contended with high asthma rates and noise pollution. 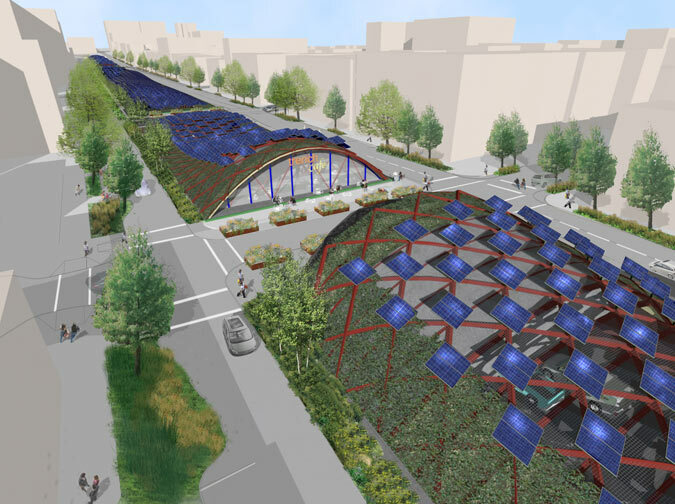 Now, the city is exploring ways to make life near the highway less onerous, including covering the trench with a “green canopy” of acoustic and photovoltaic panels to reduce noise and generate electricity. 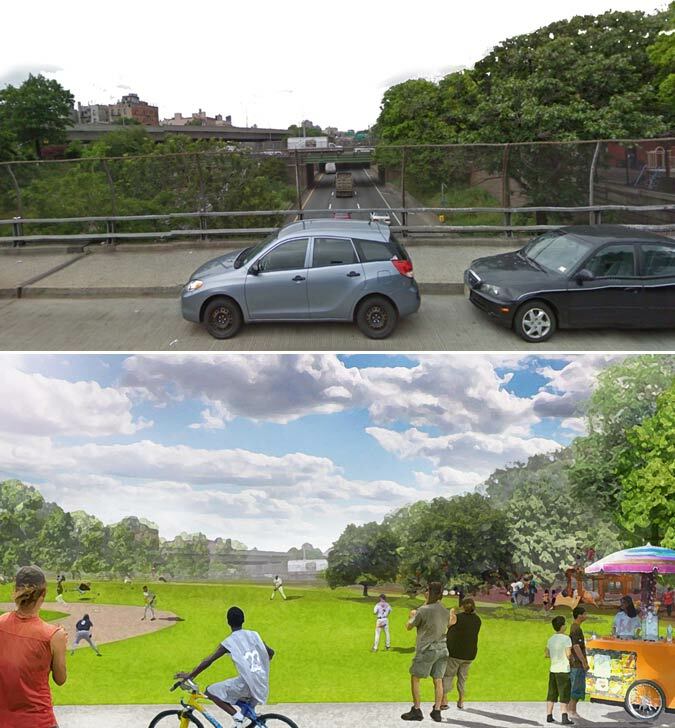 Left to right: NYCEDC’s study by Starr Whitehouse and Kiss + Cathcartis explores capping a section of the BQE trench with a “green canopy” of photovoltaic panels; the capped highway could support recreational fields; removing the highway trench provides more opportunities for community interaction. The most telling sign of the times was funding from the U.S. Department of Transportation for three highway removal projects last fall. Transportation Secretary Ray LaHood announced $600 million for 75 infrastructure projects through TIGER II, a competitive grant program designed to promote livability and sustainability. The conversion of Route 34 in New Haven, Connecticut into a boulevard received $16 million. New Haven officials have long blamed the highway for stifling foot traffic downtown and choking downtown off from the rest of the city. Now, its removal will open up 11 acres to new real estate development for the city’s biotech boom and is part of larger efforts to create a pedestrian-friendly city, according to Bruce Alexander, vice president for New Haven and State Affairs. New Orleans and New York also received grants to study the potential teardowns of the Claiborne Expressway and the Sheridan Expressway in the Bronx. 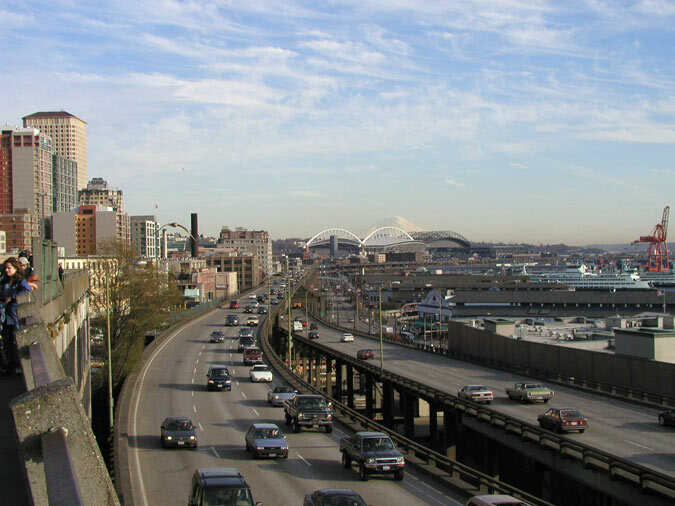 The Alaskan Way Viaduct runs along Seattle's waterfront (top); Looking south on the Alaskan Way Viaduct, a major highway slated to come down later this year; A rendering of the proposed Alaskan Way street as the surface section of the greater tunnel system. A $1.5 million TIGER II grant will fund New York’s first study of alternative uses for the Sheridan. Opened in 1962, the 11⁄4 mile highway was originally intended to connect New York to New England, but it was never finished and now merely connects Bruckner Expressway and the Cross Bronx Expressway, which already intersect to the east. 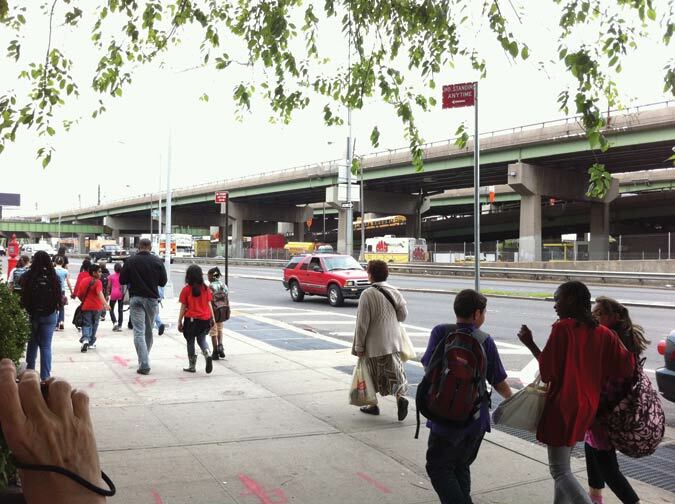 Local residents count the highway as one of numerous environmental injustices in the South Bronx, responsible for higher asthma rates, traffic congestion, and blocking access to the Bronx riverfront. It is a thoroughfare for truck drivers to Hunts Point, a major food distribution center for supermarkets in New York and New Jersey, but advocates of removal insist that the Sheridan’s low traffic volume—which amounts to 50,000 vehicles a day—justifies getting rid of it. “The design is dysfunctional for drivers, and it’s harmful for the community because it sits at the hub of retail and transportation for Amtrak and Metro North,” argued Byron, who has been working with neighborhood groups to campaign for the Sheridan’s removal for over 10 years. 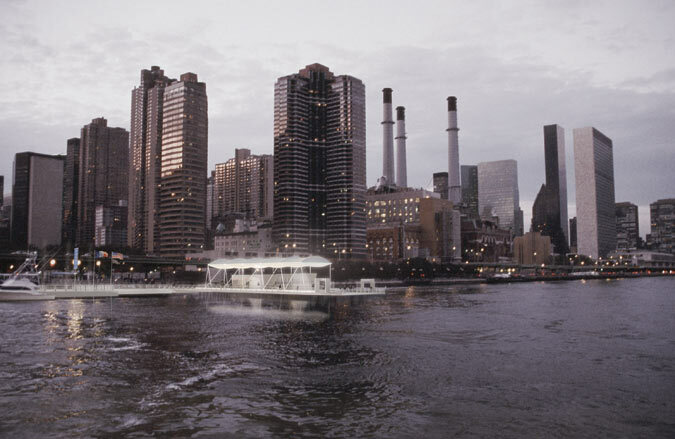 “There’s no rationale for keeping it.” In 1997, the New York Department of Transportation’s proposal to expand the Sheridan spurred local residents to action. 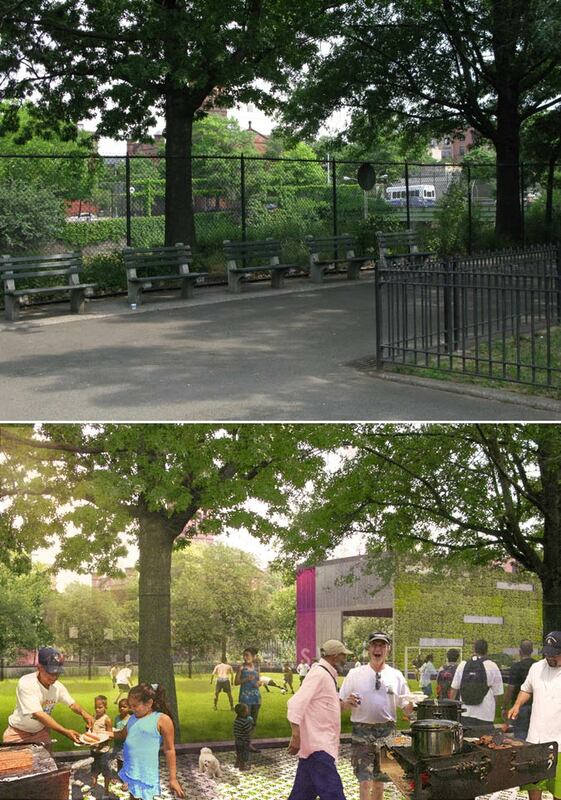 Working with the Pratt Center and other community organizations, they developed an alternative plan that would remove the Sheridan, build access ramps to Hunts Point off the Bruckner Expressway to accommodate truck traffic, free up 13 acres for 1,500 units of housing, and connect 15 acres of open space to the Bronx River Greenway. 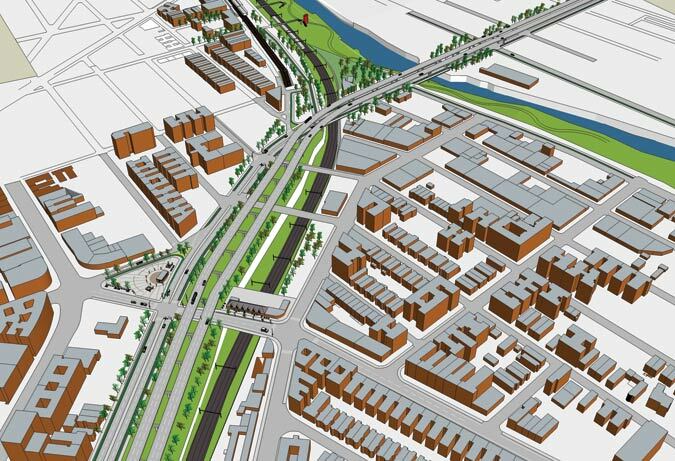 The Sheridan Expressway viewed from the Whitlock Avenue subway station (top); The proposal to remove the Sheridan in the Bronx (center) includes elevating the Bruckner Expressway at Hunts Point Avenue, where a new commuter railroad station will be built (left and right). Byron called the TIGER grant for the city’s study “huge,” because states typically run their highways with little input from municipal governments and local communities. The study will integrate the Metropolitan Transit Authority, the Department of Parks, and the New York City Economic Development Corporation into the planning process, a decision that Byron predicts will make the state much more likely to favor the alternative plan. For now, the plan remains the subject of debate between community members and businesses at Hunts Point, who are skeptical that access ramps can replace a highway that carries 15,000 trucks everyday without crippling congestion. “One of the biggest challenges has been explaining the different parts of the plan to business owners and making sure it works for them,” Byron said. What happens to traffic when a major artery is removed is probably the biggest concern for most drivers, and legitimately so. Intuition would suggest that replacing highways with boulevards with stoplights and lower speed limits would make traffic even worse. But that’s not necessarily the case, says Tom Vanderbilt, author of Traffic: Why We Drive The Way We Do. “The record seems to show that in many cases, when a highway segment is removed, the subsequent impact on traffic congestion and travel times has not been as dire as many would have predicted,” he said. Planners have consistently found that highway traffic demonstrates so-called “evaporated demand”—just as cars will come if there's a new highway, the reverse is true when highways are removed. “Traffic demand is elastic,” said Vanderbilt. 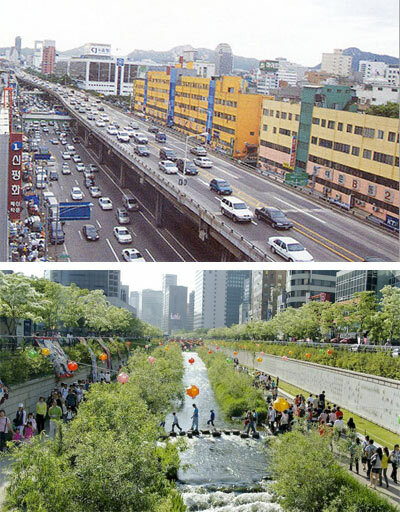 Seoul’s Cheonggyecheon Freeway before (top) was turned into a park (above). One of the most dramatic examples was Seoul’s removal of the Cheonggyecheon Freeway, a major highway that carried 168,000 vehicles a day, in 2002. Despite cries that the highway’s closure would produce chaos, adjustments to the downtown traffic system and the introduction of the city’s first rapid transit bus line were able to absorb excess traffic. Dr. Kee Yeon Hwang, one of the project’s key planners, told the Guardian, “As soon as we destroyed the road, the cars just disappeared and drivers changed their habits. A lot of people just gave up their cars. Others found a different way of driving. In some cases, they kept using their cars but changed their routes." The highway’s removal made room for the restoration of a four-mile stream that had run underneath the highway and an urban park that has become a point of pride for the city. “This is not to say you can just eliminate any highway and magically ‘cure’ a traffic problem,” Vanderbilt cautions. “But certainly in the case of highways built through major urban centers, with proper planning and given enough travel alternatives, what were once considered vital arteries in cities like Seoul have been removed—and whatever negatives on the travel side may have arisen have arguably been paid back by benefits on the public space and quality of urban life side.” The closure of the elevated West Side Highway in New York City in the 1970s presented a similar case. Sam Schwartz was an engineer at the Department of Traffic, responsible for diverting traffic after the highway collapsed. “What I found out was that the traffic was able to take different paths,” he said in an interview for the website Street Films. “Things didn’t get worse on all the other routes that had to pick up the slack.” A new highway was slated to replace the old one, but public opposition delayed the project for 30 years until then-Governor Cuomo and Mayor Dinkins announced the construction of a surface-level boulevard adjacent to a new waterfront park along the Hudson River. But even with proper planning, highway removals don’t always turn out the way advocates envision. Though it’s been hailed as one of the country’s first prominent highway removal projects, the demolition of Park East Freeway in 2003 hasn’t spurred downtown development as advocates had hoped. Demolition freed up 24 acres for development, but only the city-owned parcels—about ten percent of the land—have been sold to developers, while the county-owned parcels remain untouched. Norquist points to such new projects as a $54 million apartment tower that recently broke ground and a $175 million residential and retail development near the Milwaukee River as signs of progress. But county politics and strict regulations stand in the way of further transformation. The elevated Bruckner Expressway in the South Bronx. Indeed, the issue of highways—whether building or demolishing them—is a contentious one. It’s no surprise that Norquist got his start in politics as an anti-highway candidate running for the Wisconsin State Assembly in 1974. “I beat an incumbent who wanted to build a freeway right in the middle of a park designed by Olmstead’s son,” he recalled. The public revolt against highways in Wisconsin in the 1970s and 80s elected a block of anti-highway legislators who stopped plans for three highways. Elected officials like Norquist and his colleagues aren’t common. Removing a highway is still a political risk in cities where most residents believe it would only slow traffic. Byron points to lack of courage among elected officials as one of the main barriers to highway removal projects. 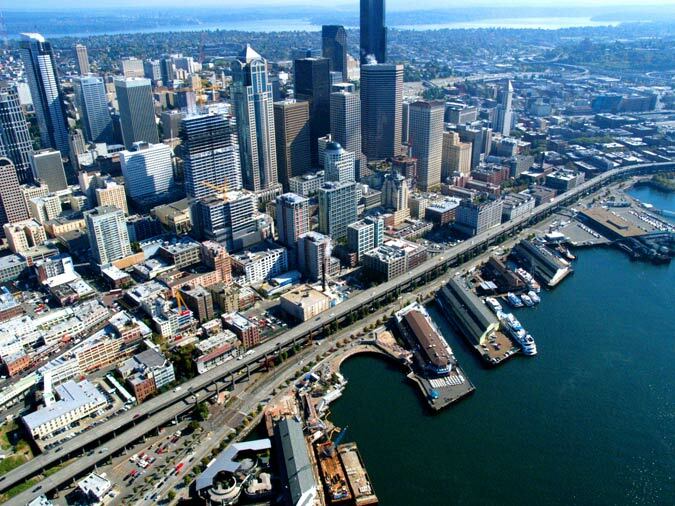 But in Seattle, Mayor Michael McGinn has taken a controversial stand against a proposed bi-level four-lane tunnel slated to replace the Alaskan Way Viaduct, a major highway that must come down after sustaining damage in a 2001 earthquake. The debate has engaged everyone from drivers, who say they need a tunnel, and union workers to environmental groups and budget hawks opposed to the tunnel’s $3 billion price tag. After months of lawsuits and public debate, Seattle’s residents will finally vote on the tunnel this August. Whatever the outcome, the vote will be a powerful statement on the future of highways. And to be sure, other cities will be watching. Arquitectonica's Revel Casino and 53-story tower rises over urban blight. Visitors to Atlantic City can walk indoors block after block, casino to casino, without ever smelling the ocean or seeing sunlight hit the sand. But with business down and competition for casinos from neighboring states heating up, state leadership in Trenton was concerned that the potential of the city’s prime assets—the ocean, the marina, and the Boardwalk—was being overlooked. Bluntly put, Governor Chris Christie and state legislators considered it problematic that any major planning or zoning overhaul needed to go through City Hall. The solution came in the form of a state-controlled tourism district run by the Casino Reinvestment Development Authority (CRDA). 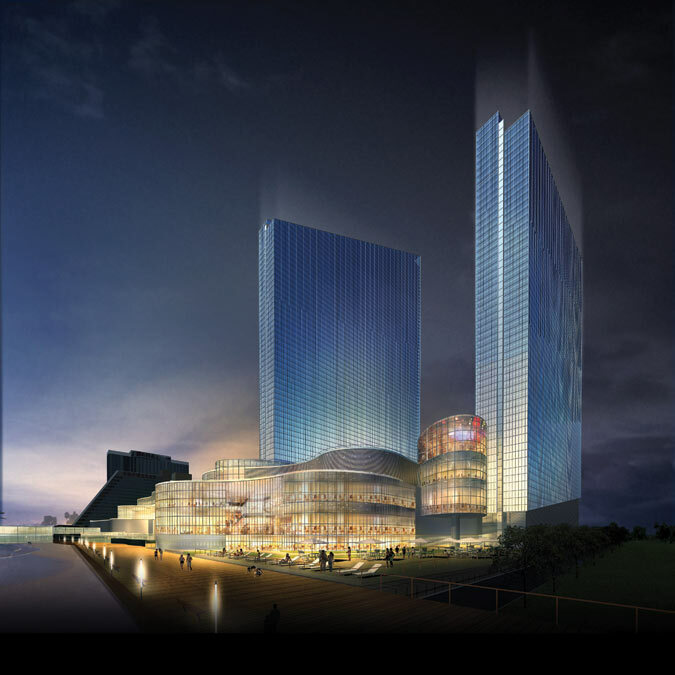 Arquitectonica's rendering of Revel Casino showing two towers. No one disputes that the many vacant lots and abandoned buildings behind the casinos along Atlantic and Pacific avenues make for a desolate atmosphere. 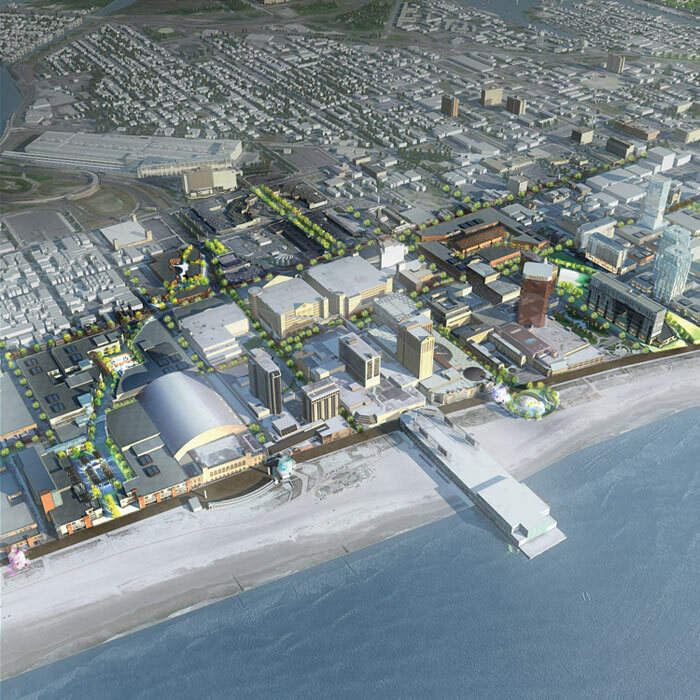 “There are certain areas on the Boardwalk where you look down to the street, and you’d say ‘I’m not going down there,’” said State Senator Jim Whelan, a former Atlantic City mayor and a prime sponsor of the legislation who, when he was mayor, sold the Atlantic City Airport to the state for $11 million in the 1990s. “We need to demolish a lot of the abandoned buildings,” he said, adding that significant buildings would not be destroyed. He noted that CRDA helped the city save and restore the Carnegie Library Center, a 1908 Beaux Arts gem in the center of town that now serves as Stockton College’s Atlantic City branch. 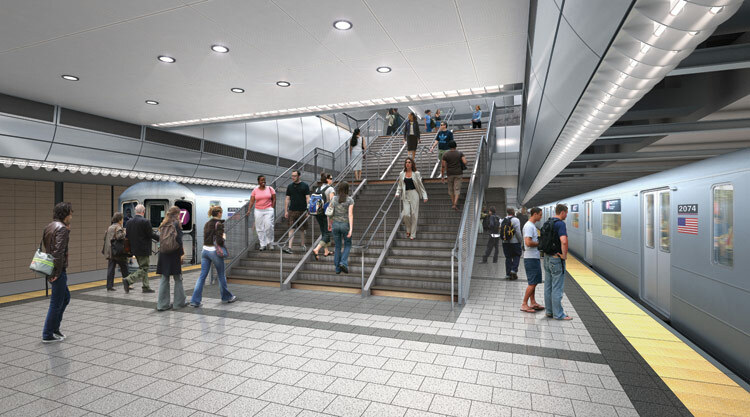 A rendering of the proposed New York Penn Station expansion cavern. New Jersey Governor Christopher J. Christie’s dumbfounding decision to cancel what is widely seen as the most important public works project in America should be a wake-up call for planners, politicians, and architects who care about salvaging the region’s future amid a climate of professed fiscal prudence and steadily shrinking public enterprise. Christie’s October 7 move to halt construction of the ARC project—the $8.7 billion transit link between the New Jersey Meadowlands and Penn Station through two new single-track tunnels—shows how short-sighted political tactics threaten to sabotage decades of planning for the public good. While, at press time, the governor had given ARC a two-week reprieve, pending conversations with furious federal transportation officials, this month’s mind-bending scenario offers an urgent lesson for large-scale investments in the region’s fraying transit, energy, and ecological networks. As we’ve noted here before, the future of architecture and planning in America lies in infrastructure—the sprawling, region-spanning systems that underpin sound design for a densifying planet. The ARC project, with funding from the Port Authority of New York and New Jersey, the federal government, and the state of New Jersey, can be seen as a model of collaborative decision-making and shared vision for the existing 100-year-old trans-Hudson tunnel. Begun in 1995 with the study of 137 different alternatives, the project has involved input from across the spectrum of public leaders, transportation and environmental agencies, and community, business, and labor groups. the Proposed project alignment through New York and New Jersey. But that collaborative vision has been jeopardized by blinkered officials like Governor Christie, who claims that New Jersey can no longer afford its share of ARC costs. Instead, the governor has devised a plan to funnel New Jersey’s $2.7 billion tunnel contribution into the state’s debt-plagued Transportation Trust Fund, where it would presumably be available for road projects and repairs to existing rail lines—precisely the kind of small-bore infrastructural thinking that has kept New York and New Jersey public transit systems in a state of perpetual panic. That question is particularly acute for the architects, planners, and engineers who are perhaps the only ones with their shirts truly on the line in the ARC project—among them Parsons Brinckerhoff, STV, and DMJM Harris/AECOM, not to mention the construction management team of Tishman, Parsons, and Arup—who bear the brunt of capricious maneuvers like Christie’s, which trade our collective future for a bogus agenda of tough-love retrenchment. New Jersey Governor Chris Christie, seen here in September, has touched off a firestorm of debate as he weighs the cancellation of the ARC tunnel. If New Jersey Governor Christopher J. Christie’s unilateral decision to cancel the ARC tunnel stands, it will undoubtedly become a case study for infrastructure investments across the country. The decision-making process, public outreach, and possible outcomes of this $8.7 billion transit link between New Jersey and midtown Manhattan will be carefully scrutinized—and indeed, that process has already begun. As of Friday, October 8, the project received a two-week stay of execution upon the request of the Obama administration’s Transportation Secretary, Ray LaHood. The result of this review—which many expect will end in Christie making good on his threat to divert New Jersey’s $2.7 billion tunnel contribution to bolster the state’s faltering Transportation Trust Fund—will have profound repercussions upon Christie’s long- and short-term political prospects, on the fate of public transit in the New York region, and on how future infrastructure projects in America will be planned, financed, and built. At the root of Christie’s rationale for cancelling the Access to the Region’s Core project, known as ARC—a years-in-the-making, multi-agency effort to connect the New Jersey Meadowlands to Penn Station via two new single-track tunnels—is a campaign pledge in which Christie vowed to make tough decisions and run like a one-term governor, instead of acting expediently for short-term political gain. He also pledged to operate the state government with maximum transparency. 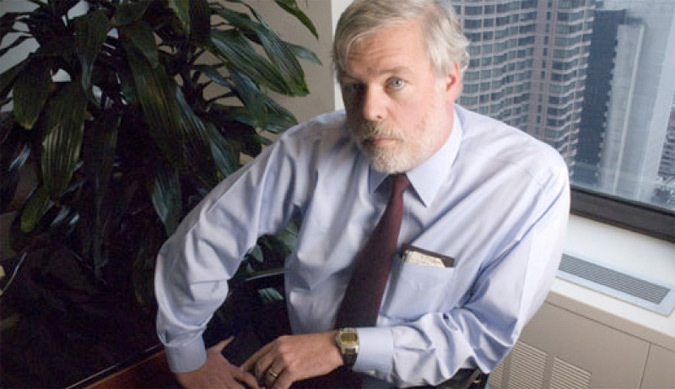 The upshot is his belief that New Jersey’s taxpayers cannot bear the risk of the ARC tunnel’s escalating cost. Since the project was halted on September 13, New Jersey officials have studied various scenarios and counseled the governor not to take that chance. This four-week examination seems to contradict a recent five-month intensive review by federal and local staff that reported on all aspects of the budget, including inflation, and found them properly accounted for. Was Christie’s team looking at the same information? That bids for the $600 million already spent have come in under budget seems to support the latter assessment. 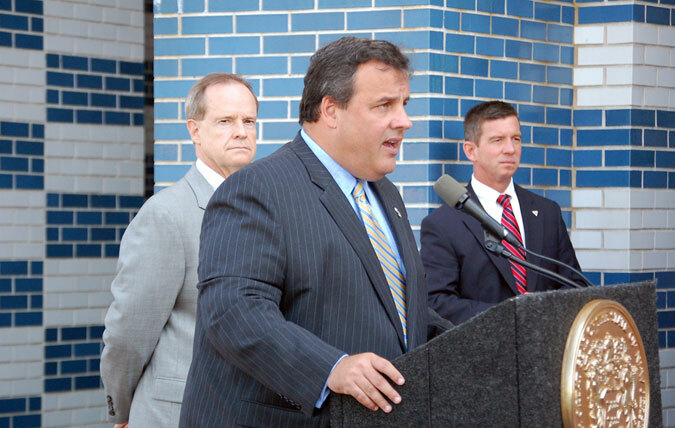 Other arguments made by the governor are inconsistent: The Port Authority pledged in 2009 to be responsible for a share of cost overruns, which contradicts Christie’s argument that New Jersey would be solely responsible. And in July, the governor seemed prepared to spend up to $1 billion to bail out the largely private investment at the Xanadu development in the New Jersey Meadowlands, claiming that “there is already a $2 billion investment in that building and I'm not ready to give up on it." Future analysts will ask what calculus makes private investment today worthy of a bailout when a public investment is not. What will the economic outcomes of Christie’s decision be, and what bearing will it have on him? If he uses New Jersey’s $2.7 billion tunnel contribution to bolster the Transportation Trust Fund—barely a third of which he can use, according to funding formulas—he will forfeit the $6 billion match by the Port Authority and the federal government. He will also forfeit the $18 billion increase in property values to many New Jersey communities (only one of the many benefits that an independent study by the Regional Plan Association forecasts). 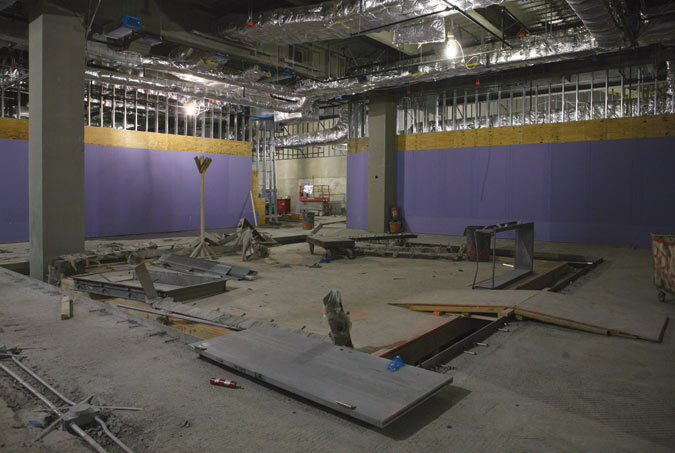 Shoring up the Trust Fund with what remains of the ARC project (which may serve the fund for a year at best) will be scrutinized for its rate of return when compared to ARC. In a political climate where the suggestion of raising taxes is a form of political suicide, where will the Fund look for replenishment when the diverted ARC dollars run out? How will this square with Christie’s campaign pledge regarding quick political fixes? One lasting lesson that will surely come from Christie’s cancellation will be that for projects of this scope to succeed, they must have overwhelming public support. 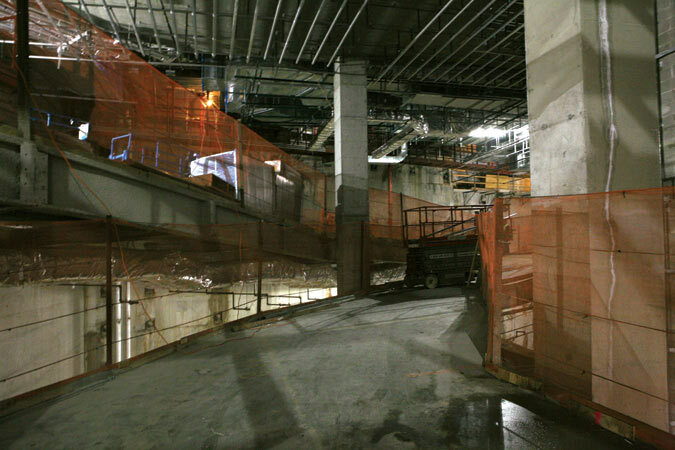 By the time it broke ground, ARC had become so complex that when Christie first announced a suspension of construction, even the local Sierra Club supported him and lampooned the project as the “tunnel to Macy’s basement” (they have since recanted). The necessity of infrastructure projects like ARC may seem self-evident to some, but they are abstractions to the general public and must be convincingly and perpetually sold to them. It might need ongoing viral support on Facebook or other social networks. Or perhaps simple analogies should be regularly transmitted via the media to support the project at critical junctures. One such analogy (dropping a few zeroes) to explain ARC’s value might go like this: Using the tunnel allocation to pay off the Trust Fund is like using your pension contribution to buy a $30,000 car today. In doing so, you sacrifice the $60,000 two-to-one contribution from your employer. After ten years, your contribution would have yielded at least $180,000, but the car you purchased then is now worth close to zero. Might putting its value in terms like these make it clearer? The overriding question that future infrastructure planners will ask is how any projects of significant scope can be executed in America today if one individual can stop decades of carefully laid plans. They will ask why the federal government, when it has a majority stake in a project like ARC, doesn’t have a say. Governor Christie purportedly declined to speak with Transportation Secretary LaHood minutes before his announcement but did speak with him the following day, which resulted in the decision’s delay. It is unclear at this point what LaHood had to offer, but some are guardedly hopeful that an agreement on oversight and overages can been reached. Whatever the outcome, future planners and legislators will consider whether a governor with the least money on the table should have so much unilateral power. 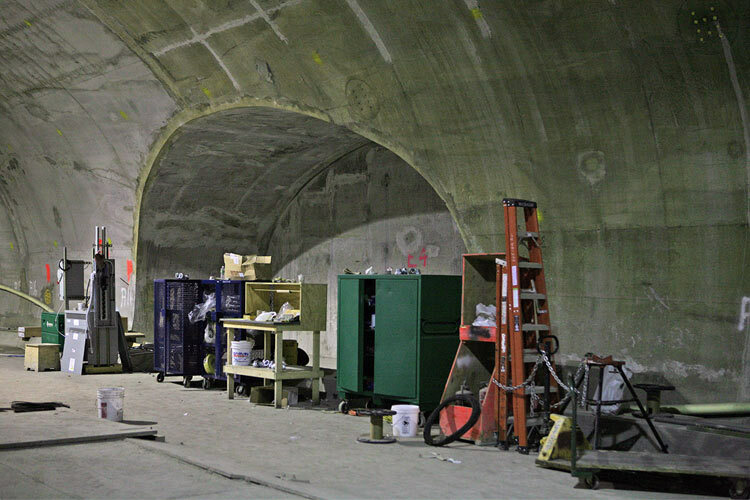 Will the tunnel ever be completed if Christie stands by his October 8 decision? Many claim that it is hard to imagine repeating the effort again, especially if its prospect can be snatched away at the last minute. 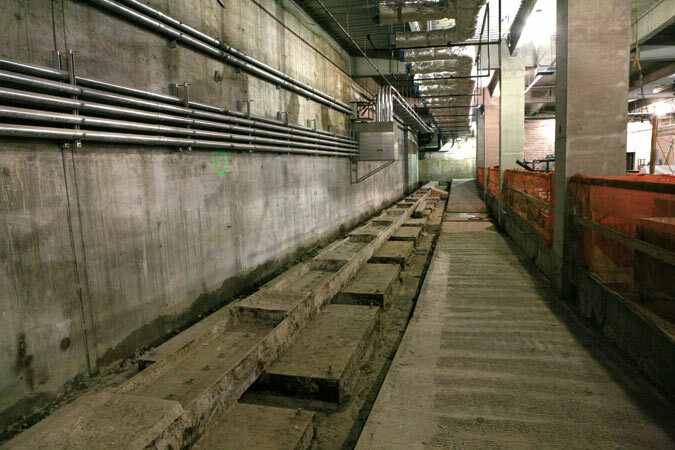 Optimists might argue that the 2nd Avenue Subway was restarted after many decades’ cessation. Others may hope that if the governor runs like a one-term governor and the voters make sure of it, this project will resume, but this is highly uncertain, as other states are already angling for the ARC funds. Or perhaps this isn’t over; perhaps this is all a high-stakes gambit on Christie’s part to get the federal government to ante in on overages. If this does occur, and Christie changes his mind after the stay, his temporary pause could go down in history as a necessary step to apply the highest level of scrutiny to protect the taxpayer’s investment, and Christie’s reputation for fiscal responsibility will be affirmed and may even be appreciated by constituents beyond his base. But if his real motive is to plunder ARC to shore up the Trust Fund, and his opponents can make this allegation stick and claim that he opted for the quick political fix, history may add Christie to the pantheon of his many predecessors in the governor’s office who sacrificed New Jersey’s future for short-term political gain. Given that ARC would have built an extension to the existing Penn Station (albeit below it and at some remove), it is difficult to detach current events from the memory of the last Penn Station’s demolition in 1963. 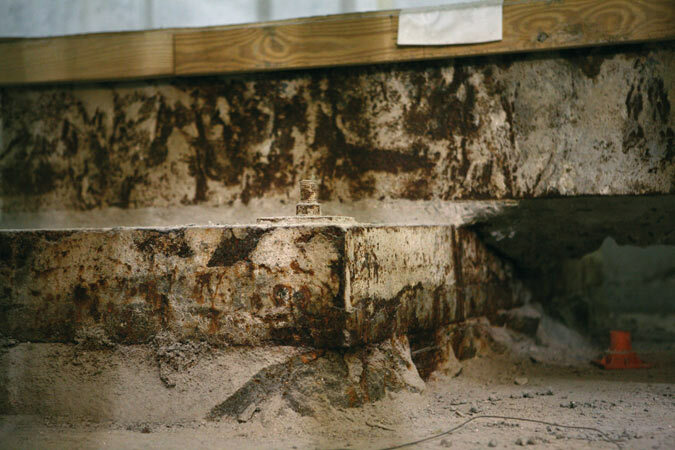 One only needs to see the many shrines built into the architecture of NJ Transit’s new entrance on 7th Avenue to know that its loss is still being actively mourned after 50 years. Its demise was then labeled “an act of civic vandalism,” but it fueled enough outrage that it led to the creation of the Landmarks Preservation Commission and ultimately to Grand Central Terminal’s salvation from a similar plight. That Grand Central was saved by a proto-viral response of concerned citizens (and celebrities like Jackie Onassis) affirms an important lesson that ARC’s planners may have not remembered: Support for projects like ARC must be argued with conviction. In 1963, Ada Louise Huxtable eulogized Penn Station when she wrote that “we will probably be judged not by the monuments we build but by those we have destroyed.” What would she say today of the difficulties we have of even getting past the planning stage? 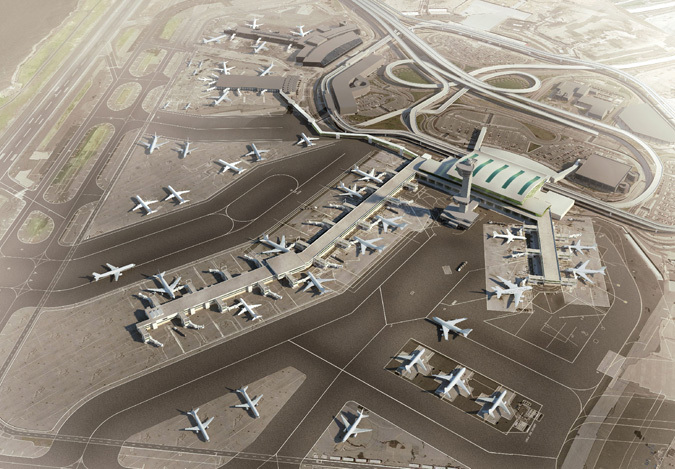 SOM is designing an expanded Terminal 4 at JFK, which will include nine new gates for Delta Airlines. JFK airport is entering a new jet age—one without many of the iconic terminals that defined the previous one and established the cool, hyper-modern look of flying for generations of travelers. To that end, the Port Authority of New York and New Jersey announced an agreement today with Delta Airlines for a $1.2 billion expansion of Terminal 4 that will lead to the subsequent demolition of Terminal 3, the former Pan Am Worldport. Designed by Tippetts-Abbett-McCarthy-Stratton, the 1960 Terminal 3 is famous for its flying saucer–like shape and rooftop parking, and for receiving the Beatles for their historic arrival in America, though a 1972 expansion has marred its original character and led to numerous complaints about it being the worst of JFK’s eight terminals. The Port Authority and Delta insist the building is beyond repair, arguing that its replacement with taxiways and plane parking will improve efficiency at JFK, by some measures the most congested airport in the world. The original Terminal 3 was considered revolutionary when it opened, but it soon became outmoded due to larger planes and a later expansion that destroyed much of its charm. Top to Bottom: Terminals 2, 3, and 4 today. 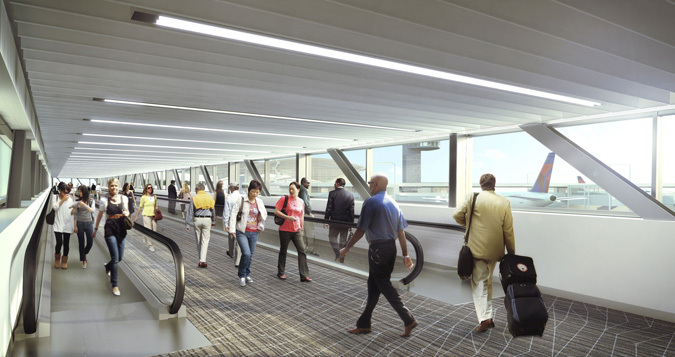 When the project is finished, Terminal 4's Concourse B will expand by 9 gates, a connector will extend to Terminal 2, and Terminal 3 will be replaced by plane parking and taxiways. Terminal 3 will not be demolished until 2013, when the expansion of Terminal 4 is due to be completed. 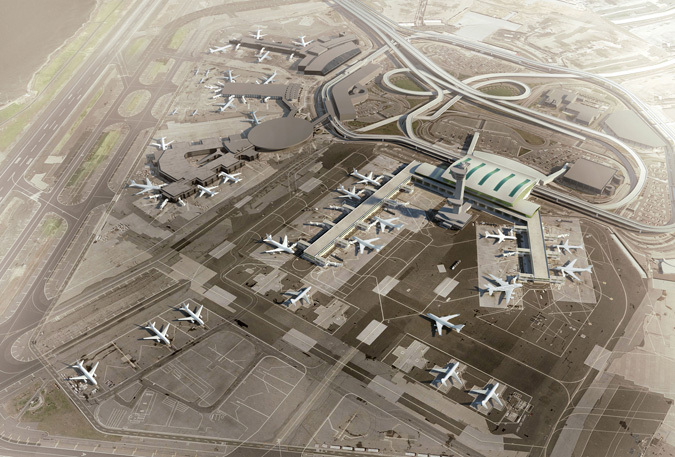 That project is being designed by SOM, who designed the rest of Terminal 4, and will include nine new gates for Delta, for a total of 25, 16 of which will be used by Delta for its international flights. 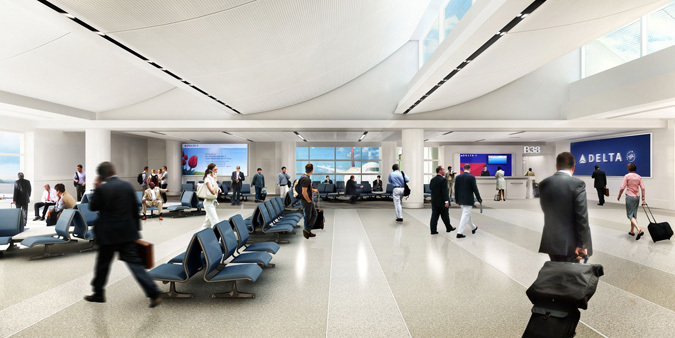 A connection will be built with Terminal 2, which will continue to serve Delta’s domestic passengers, and security and baggage handling facilities will be expanded to accommodate the additional passengers. Otherwise the terminal will look much as it did when it opened in 2001. Port Authority executive director Chris Ward said there will be no interruption in service due to the project, nor would the expanded terminal cause additional delays at the busy airport. 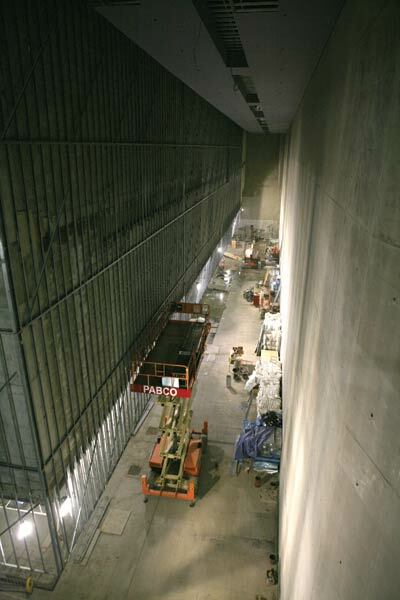 “If anything, it will improve it, providing Delta with a more efficient operation,” Ward said. This is because the elimination of Terminal 3 will allow for double taxiways for both Terminal 2 and 4, and parking for planes so they may move between the gates, runway, and hangar more readily. A new connector between Delta's Terminal 2 and the expanded Terminal 4. Rappaport said her larger concern remains the preservation of I.M. Pei’s Terminal 6, which is slated for demolition next year to make way for another expansion of JetBlue’s facilities. Susan Baer, who was named the Port Authority’s director of aviation last fall, said that neither has been deemed worthy of retaining. “In the environmental review, all our experts said that Terminal 6 could come down but that we should save Saarinen, the significant one,” Baer said. 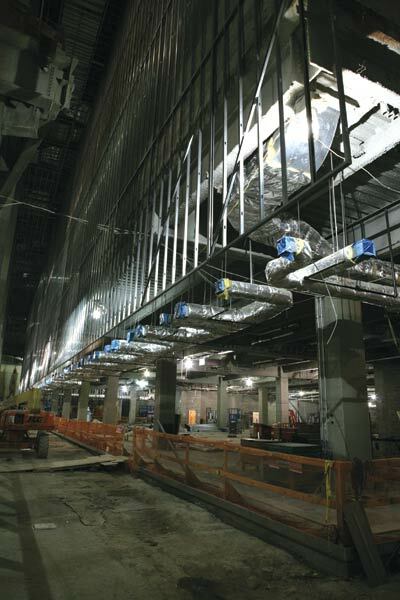 She added that the $20 million renovation of Terminal 5 is nearly complete, though a Port Authority spokesperson said an opening date has not yet been set. Security facilities will be expanded to cope with more passengers as well as new measures implimented since the terminal opened in 2001. John Morris Dixon, the former editor of Progressive Architecture, said he remembers Pan Am’s Terminal 3 fondly, from when he wrote about it for the magazine when it first opened. “You had this great statement, this canopy, with the planes nuzzling in beneath it,” he said. “But it was outdated almost immediately” due to the trend toward ever larger planes. He agrees that the 1972 addition has made the terminal “miserable,” akin to what Robert Moses did to Penn Station, and noted that mounting a case for its salvation will be difficult.